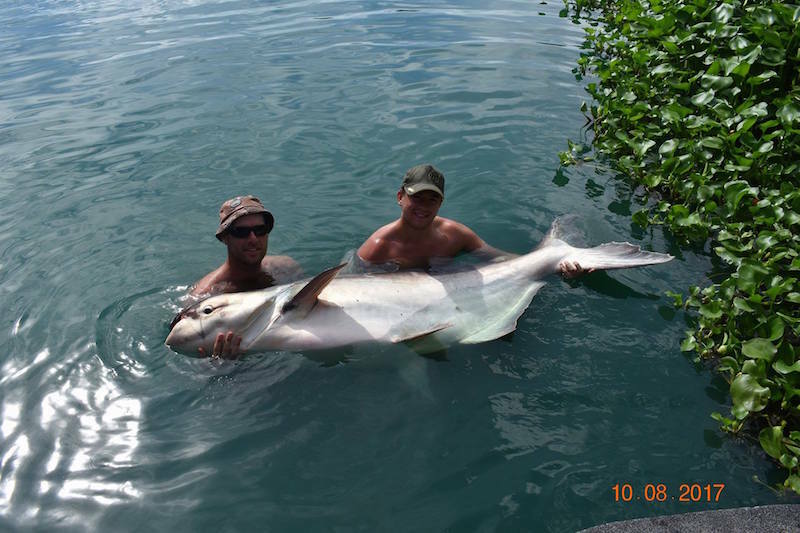 Welcome to another month of captures here in paradise at Gillhams Fishing Resorts. 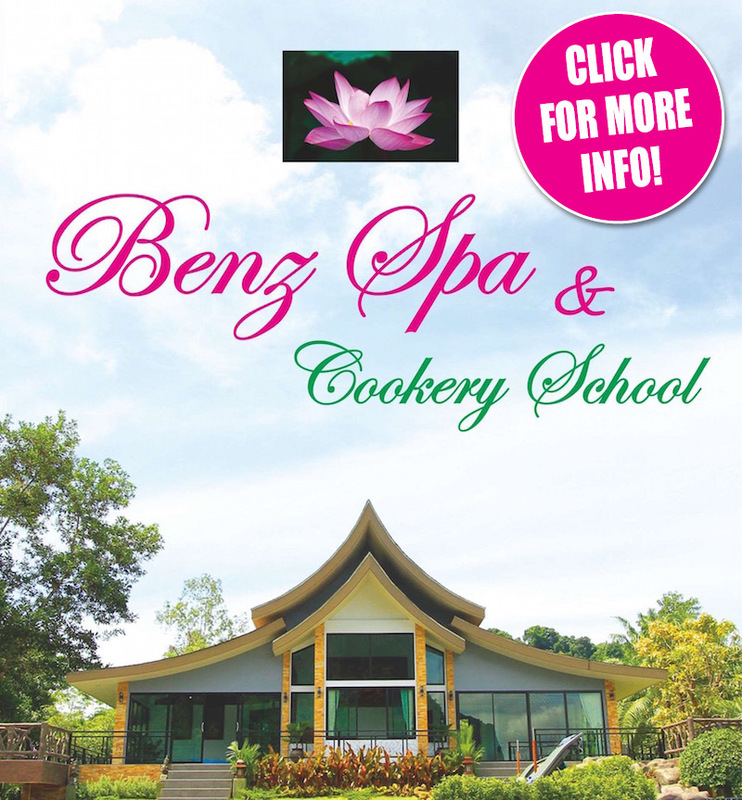 We would like to thank all our readers and everybody that follows us on social media. 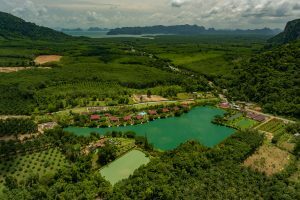 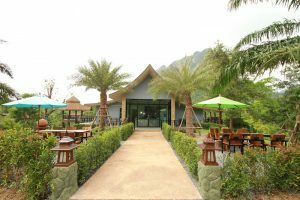 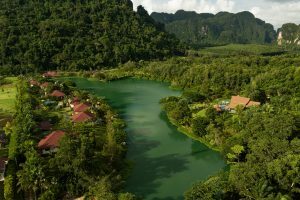 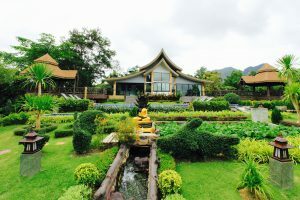 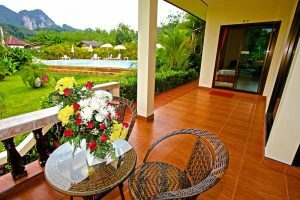 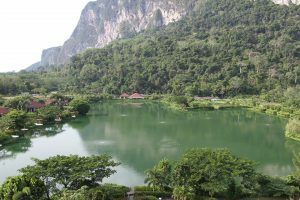 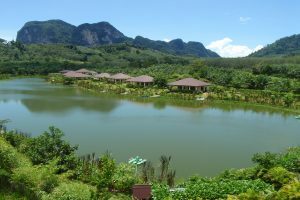 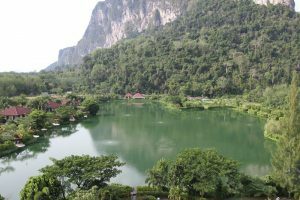 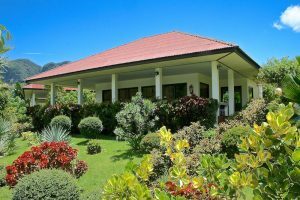 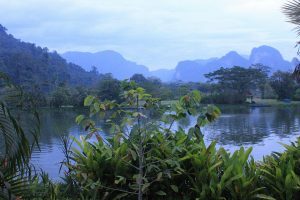 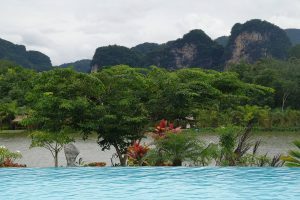 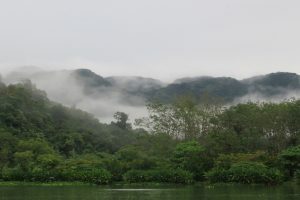 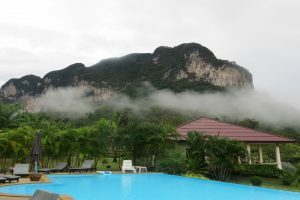 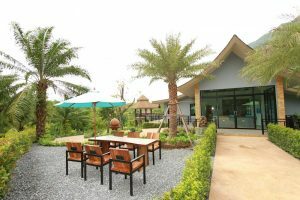 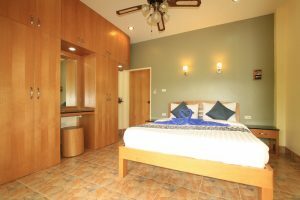 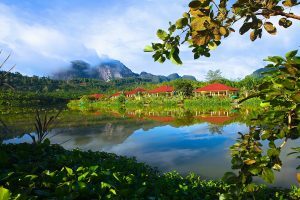 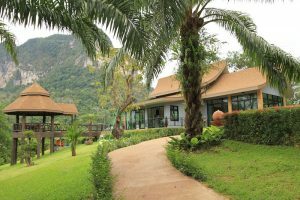 We’ve been waiting for the heavy rains to make their way to Krabi so that we can net some of the ponds around the resort and get some new stock in the lake. 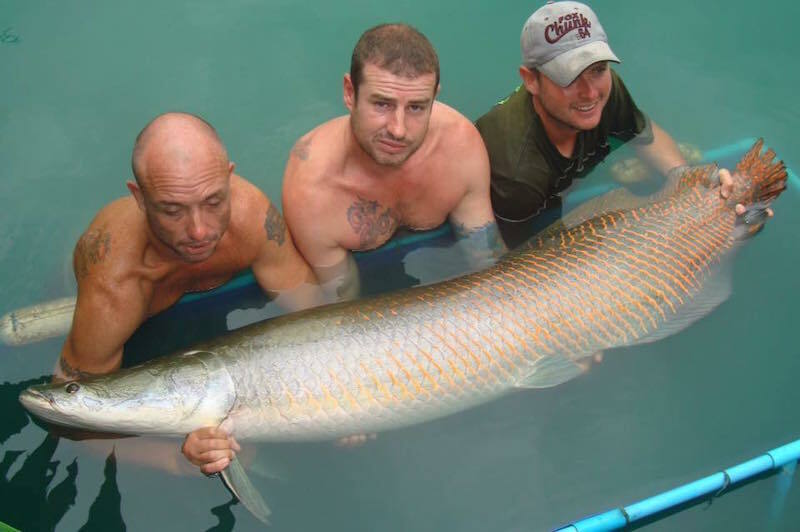 We like to grow our own fish so that we know their health and can control the food, especially the arapaima. 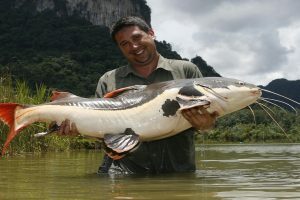 These fish can consume large amounts of food daily and can seriously pack the weight on, but this can come with a price. 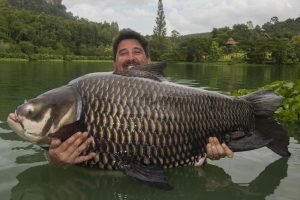 If you put too much weight on these fish too fast, you will make them unhealthy and will put too much strain on their hearts, which will lead to fatalities when they get caught for the first time, so their diets are worked out so that the fish grow at a steady rate and enter the lake fit and healthy. 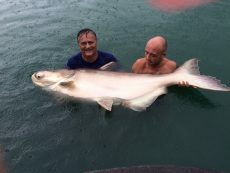 Once we had a couple of days of heavy rain, it was time for some fun. These fish are crazy and when they feel threatened they explode with phenomenal power. 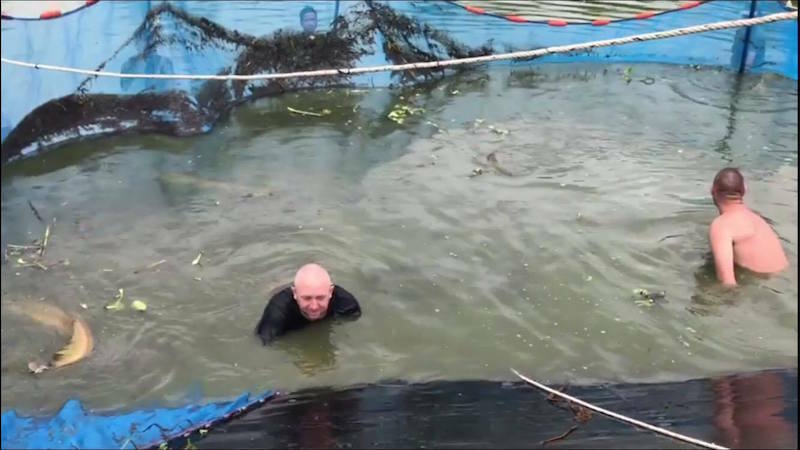 We’ve got video footage showing the netting on our Facebook page where you’ll see what happens as the net closes in, a few people did get hurt as these huge creatures take to the air as the net closes in, but its all part of the fun and one hell of an experience for anybody lucky enough to witness the netting or anybody unfortunate enough to be inside the net taking them out. 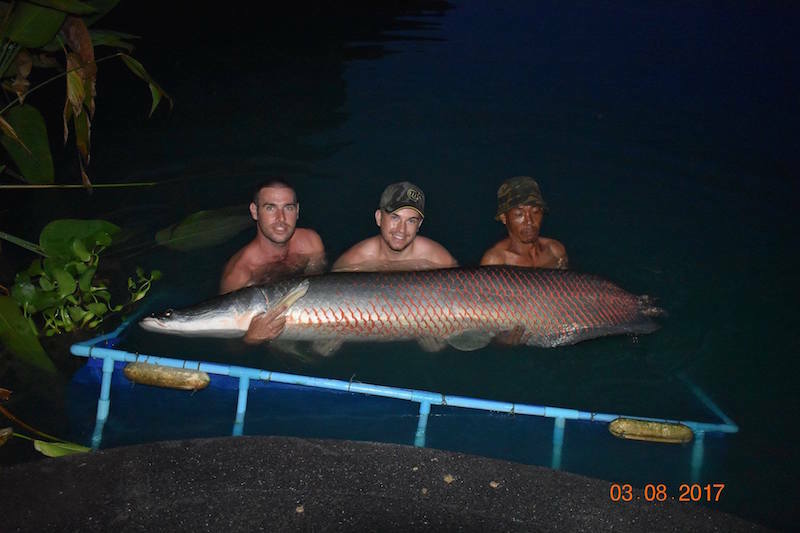 Most of the arapaima were around 140/160lb with a couple of bigger ones and a few smaller that went back into another pond to be grown on more. 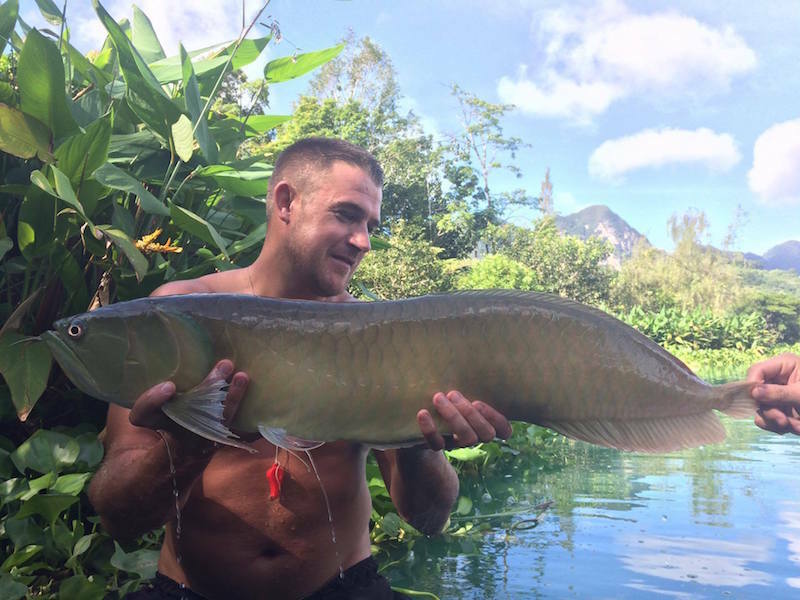 We added ten new arapaima to the lake along with Amazon redtail catfish, tambaqui and Siamese carp. 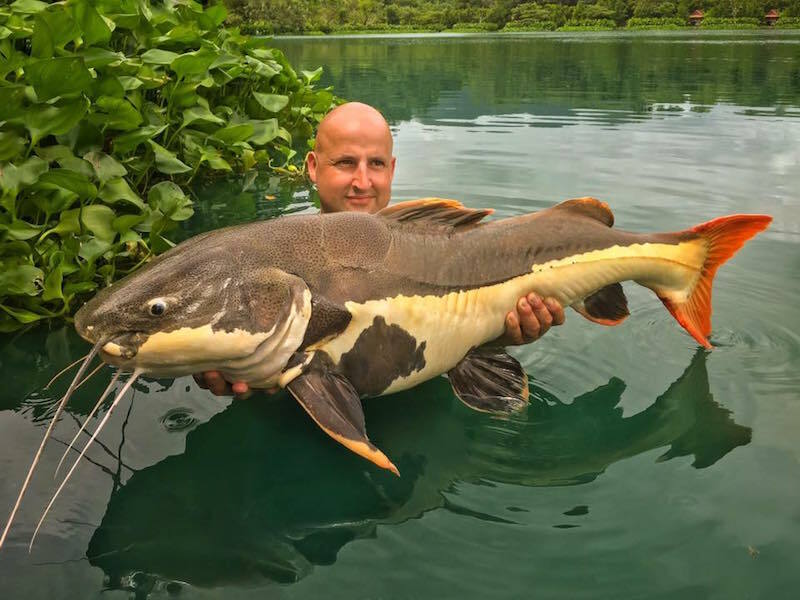 Whenever new fish go into the lake, it triggers other fish to feed as well as the new fish feeding very confidently, as they’ve never been hooked before. 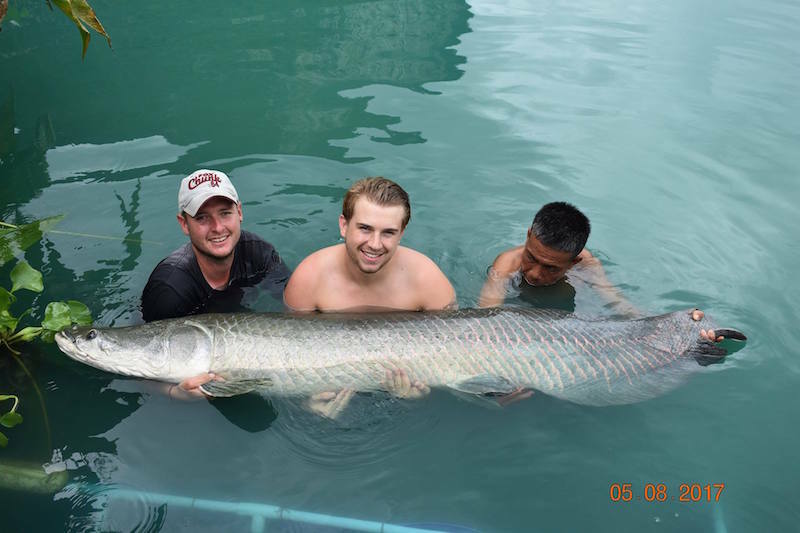 You’ll see in the catch report at the end of September that the arapaima catch rate would have increased, and this will be due to the new arapaima being stocked. 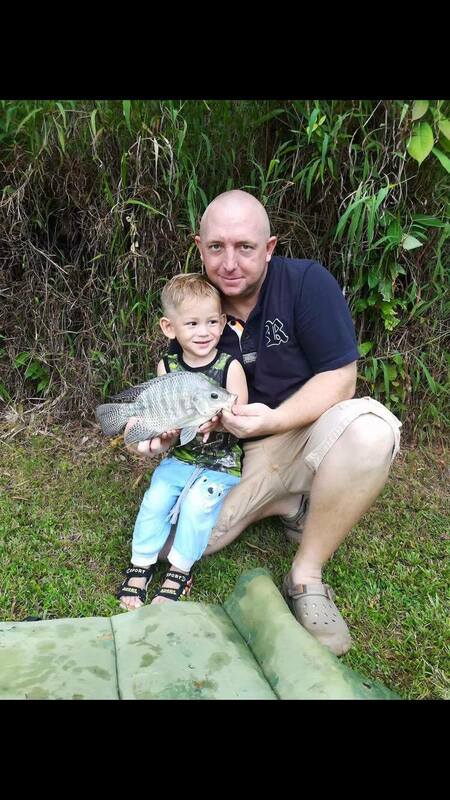 I’m happy that my son Tyler has started showing an interest in fishing and had his first fishing trip at the small lake last week. 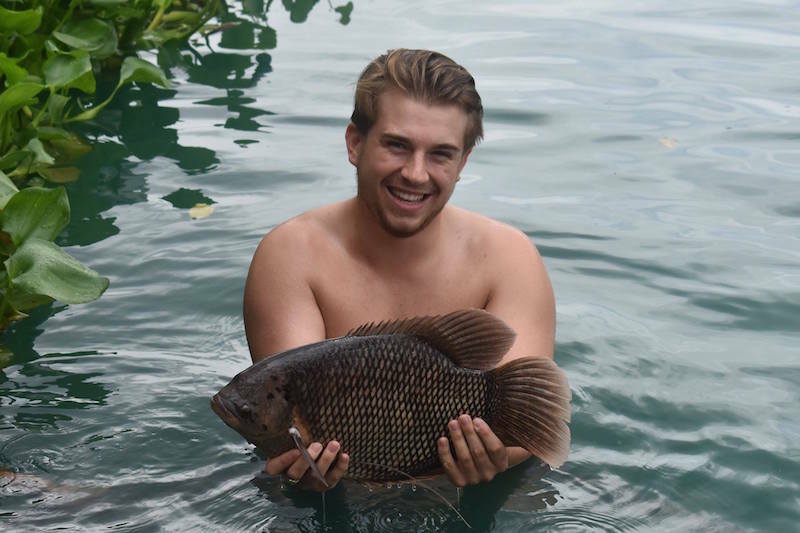 We just targeted tilapia in the margins so that he could handle them easier than other species in the lake, but he still needed some help, as he’s only two years old. 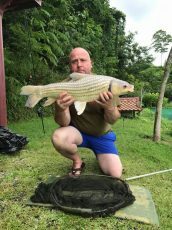 It’s a good start, learning the same way most of us did, starting off small and building over the years. 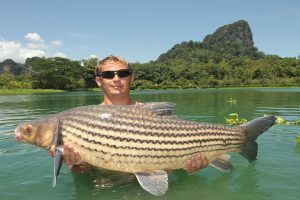 It’s still safe to say though that he will be landing huge fish before most people if he stays keen. But at least he started off the same as I did using whips, float fishing and catching small fish. 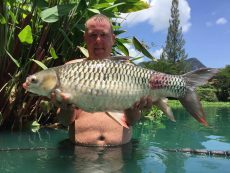 It’s also come to that time of the year again when Stuart packs up and heads off for his end of year fishing trip. 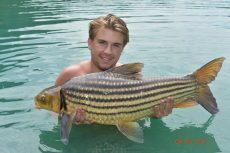 First off he will be heading to Paradise Lodge in Panama with a group of friends, and we will hopefully have some news and photos in next month’s newsletter. 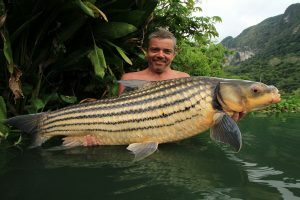 Stuart will also be pike fishing in search of more monsters, and again this will all be mentioned in the next newsletter and we will hopefully have some pictures of huge pike to show. 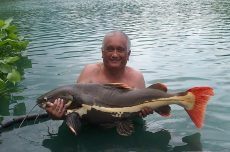 Good luck, Dad, I hope you catch some whackers. 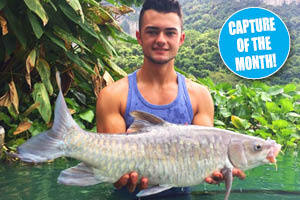 It’s that time again, so let’s get on with this month’s fishing and find out what’s been getting caught and which species have been landed. 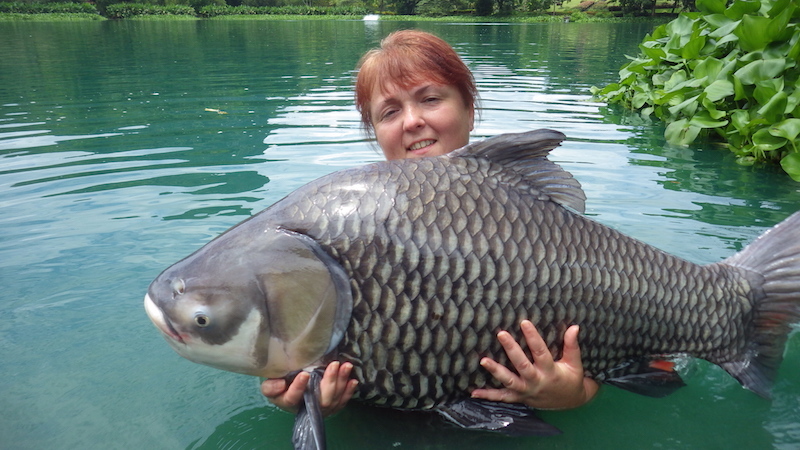 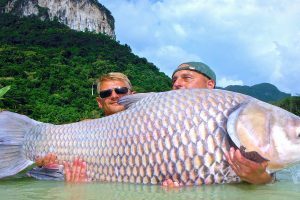 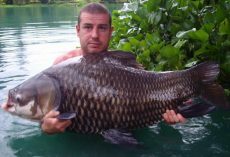 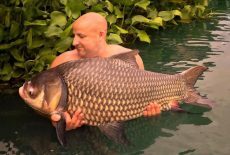 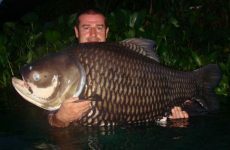 The Siamese carp and Julian’s golden carp have once again been making many anglers very happy with 42 Julians being caught this month and 177 Siamese carp with 35 over the magical 100lb with the biggest at 172lb. 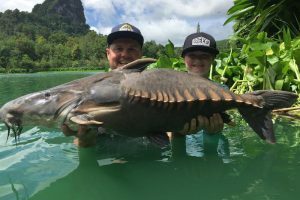 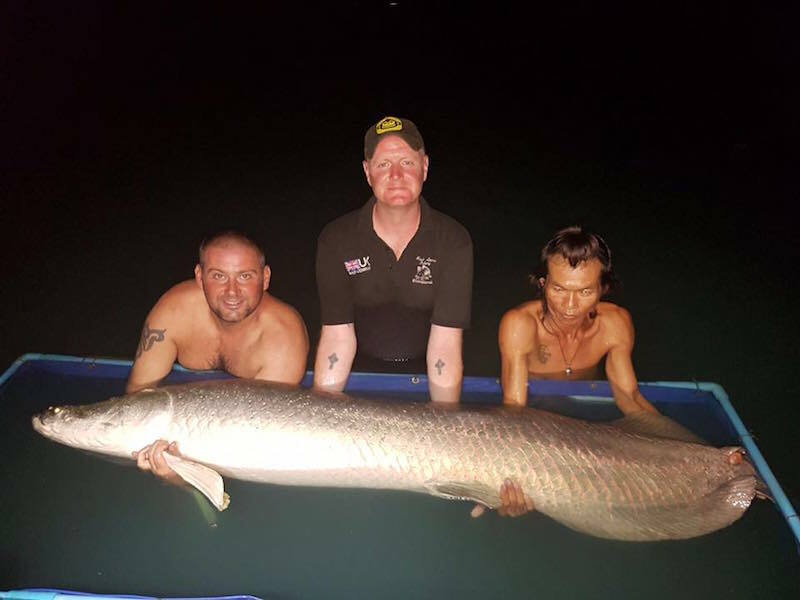 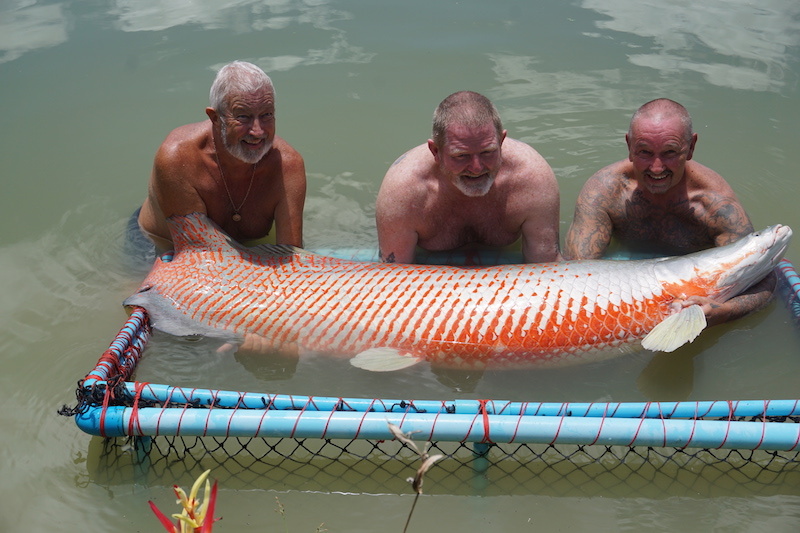 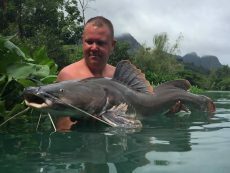 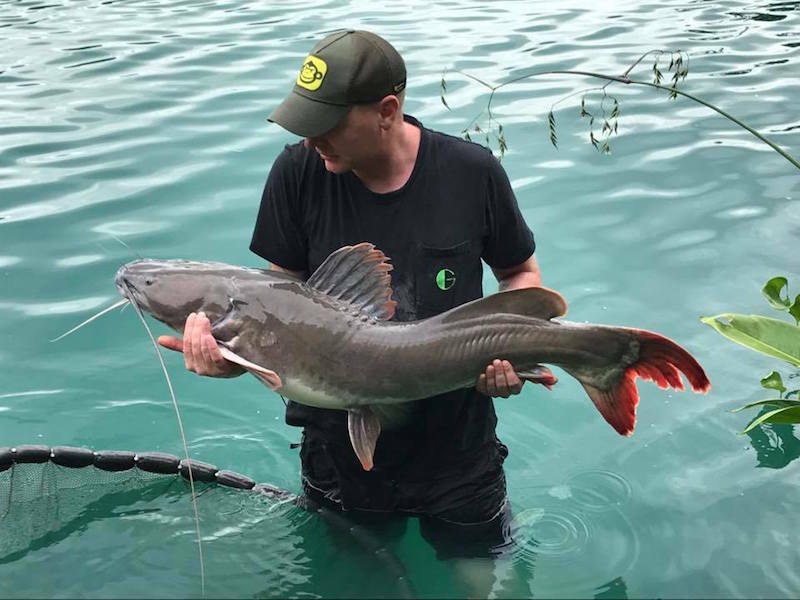 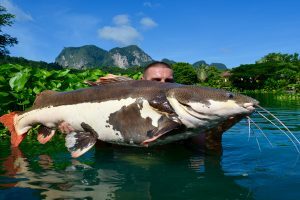 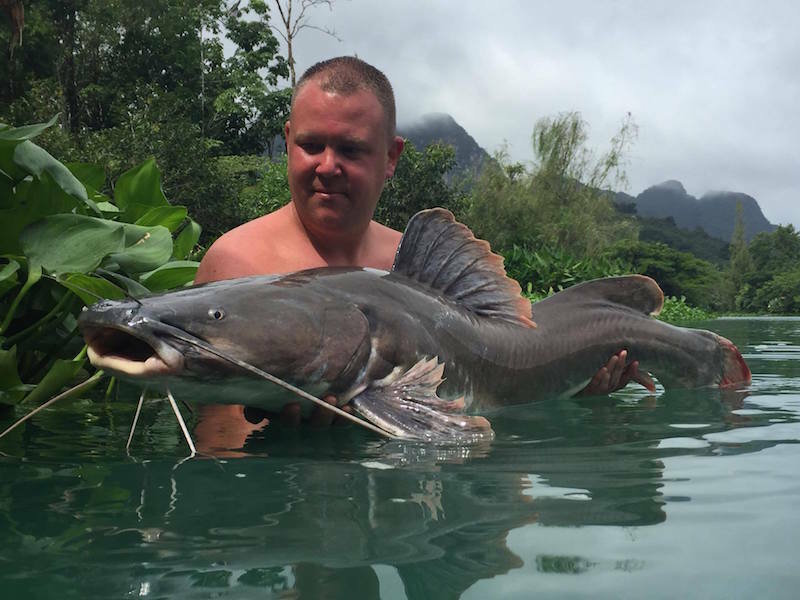 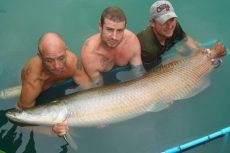 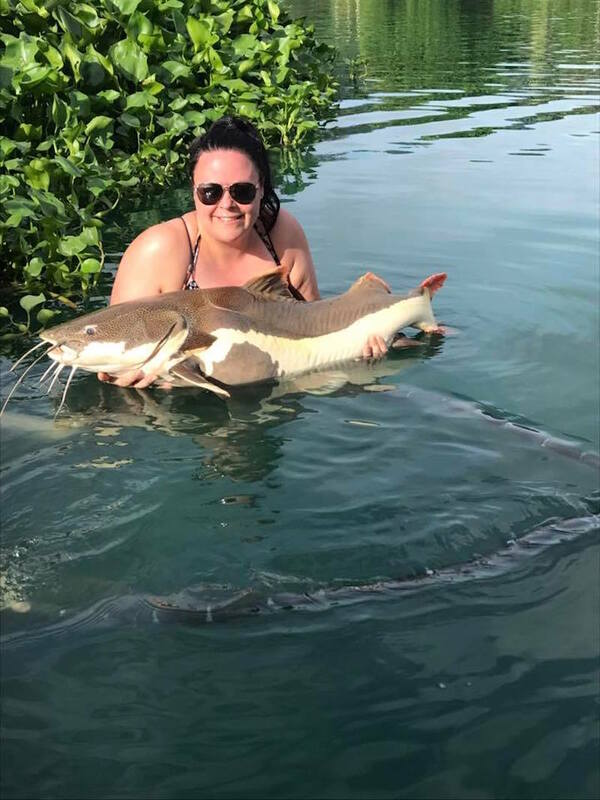 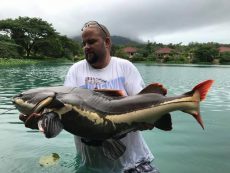 The anglers who visited us for the exotic fishing Thailand has to offer had some good fishing in Krabi this month with a total of 572 fish caught of 21 species, made up as follows: 39 arapaima to 400lb, two arawana to 8lb, three alligator gar of 25lb, 128 Amazon redtail catfish to 75lb, 68 Asian redtail catfish to 50lb, six barramundi to 3lb, 43 black pacu to 36lb, one Chao Phraya of 130lb, two featherback to 12lb, two giant gourami to 7lb, one Hoven’s carp of 23lb, 42 Julian’s golden carp to 55lb, one mahseer of 10lb, 19 Mekong catfish to 210lb, twelve Nile perch to 6lb, two ripsaw catfish of 26lb, one rohu of 20lb, eight red bellied pacu to 12lb, 177 Siamese carp to 172lb, four tilapia to 5lb and seven tambaqui to 45lb. 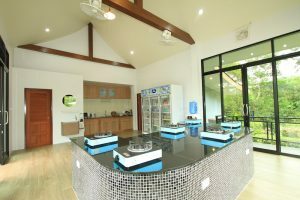 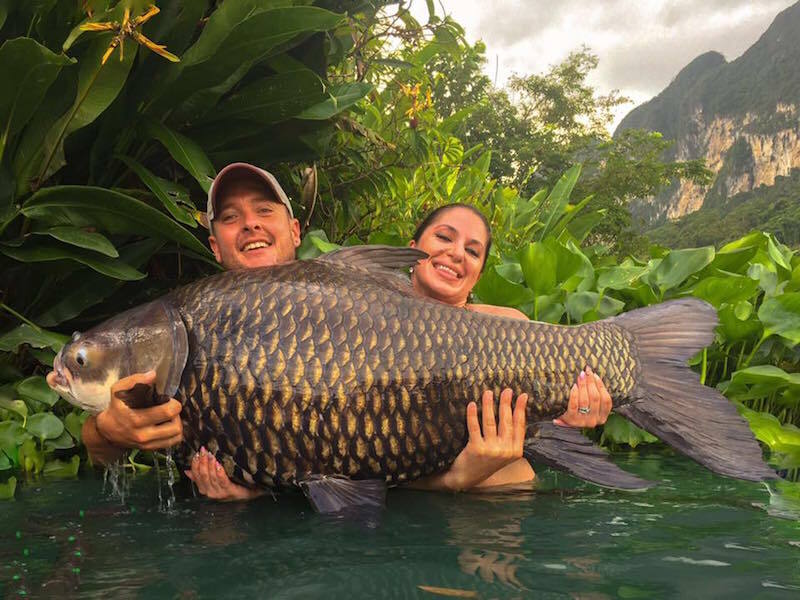 Dave and Arezue Wright made their first trip to Gillhams in August celebrating their wedding, the fishing crazy couple thought Gillhams would make the perfect honeymoon destination after following social media posts for a while. 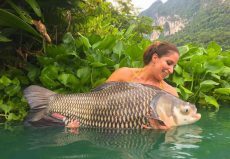 Arezue has only been fishing a couple of years and has already made a name for herself in the carp scene back in the UK. 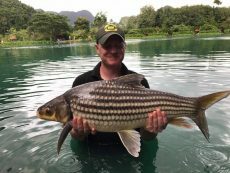 The first couple of days both Dave and Arezue struggled and were finding it quite frustrating as other anglers on the lake were all catching. After a couple of days and with the help of the guides they started to find their feet and land some fish. 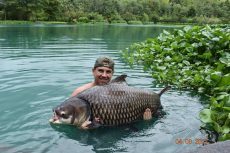 There was no real competition between Dave and Arezue; they were just happy fishing together and seeing each other catch fish. 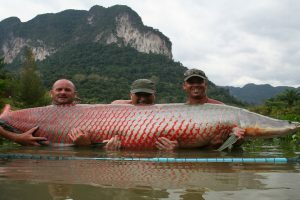 They caught all the species they wanted between them but still have plenty of bigger fish to come back for. Arezue seemed to be a magnet for Julian’s carp, catching six to 55lb. 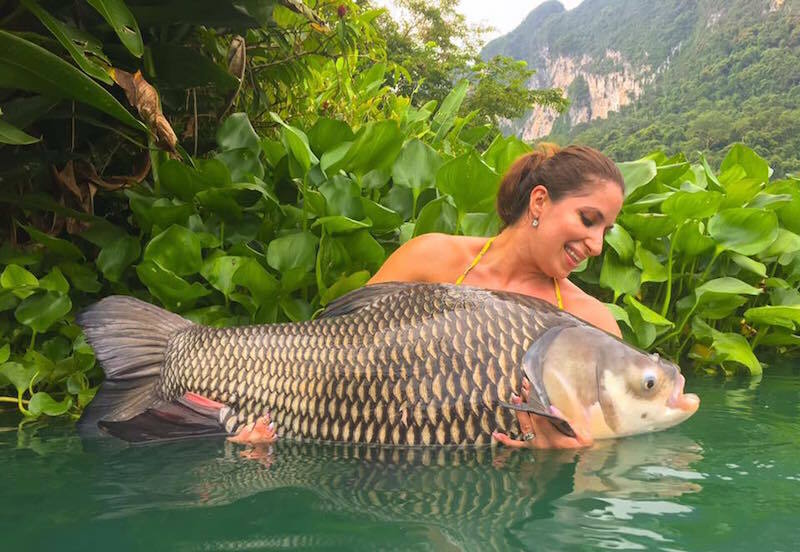 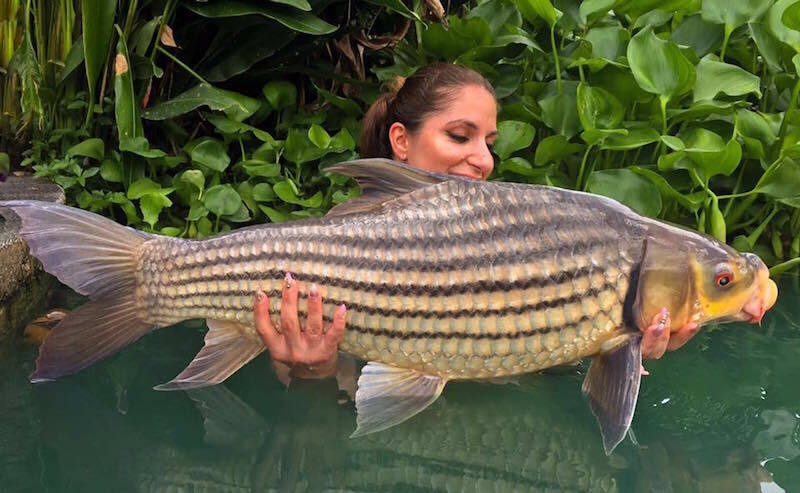 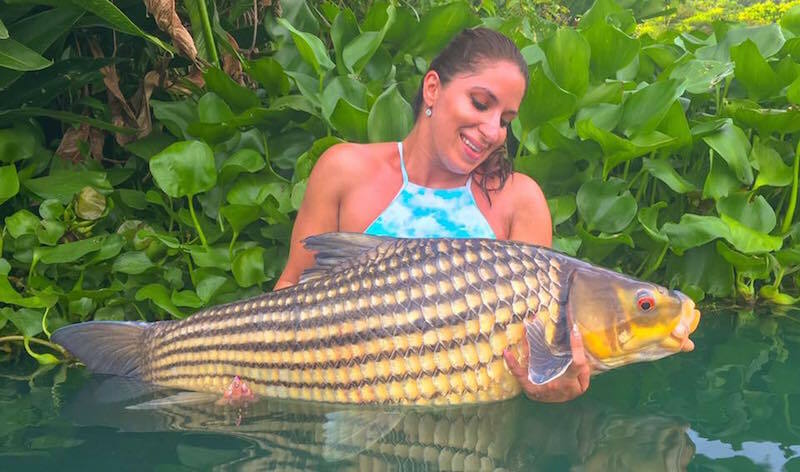 In total Arezue caught 12 fish of five species with her biggest fish being an arapaima of 110lb followed closely by a Siamese carp of 90lb. 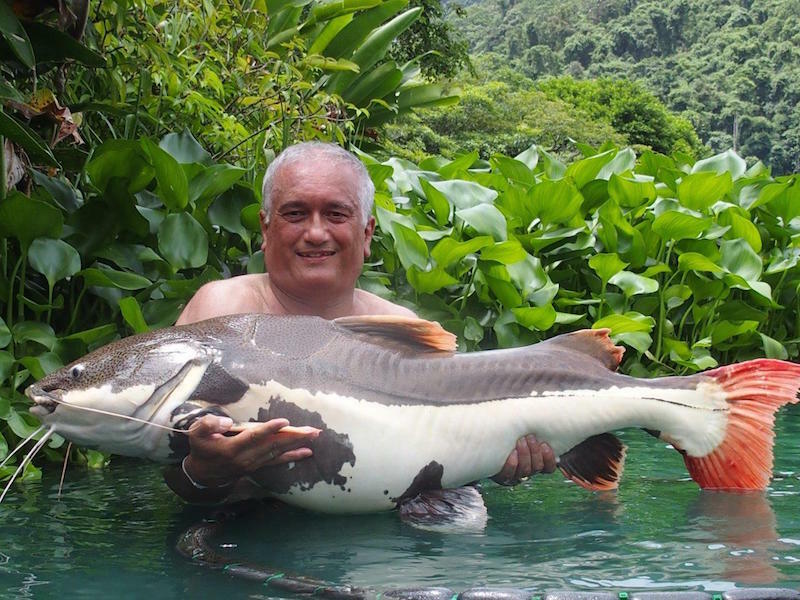 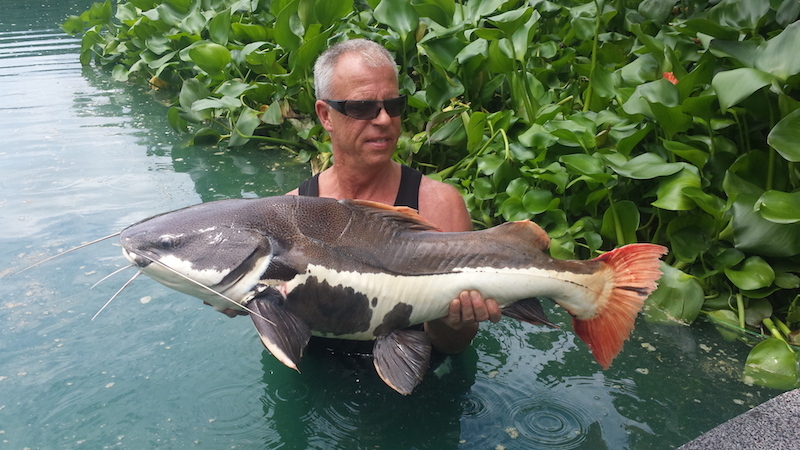 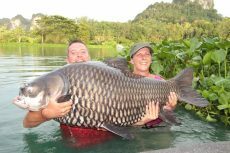 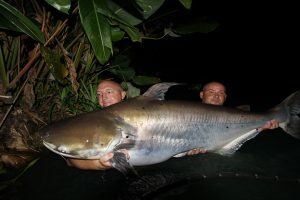 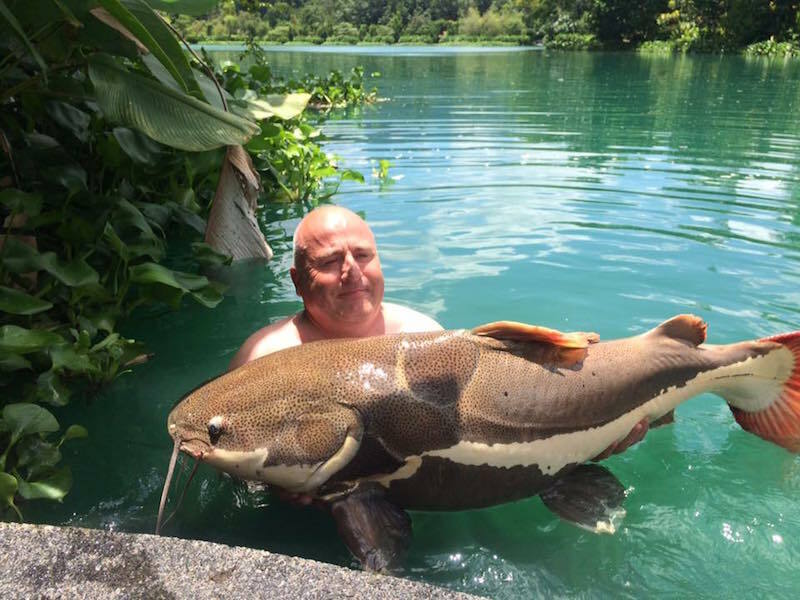 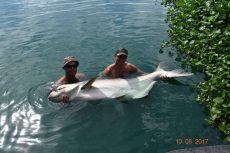 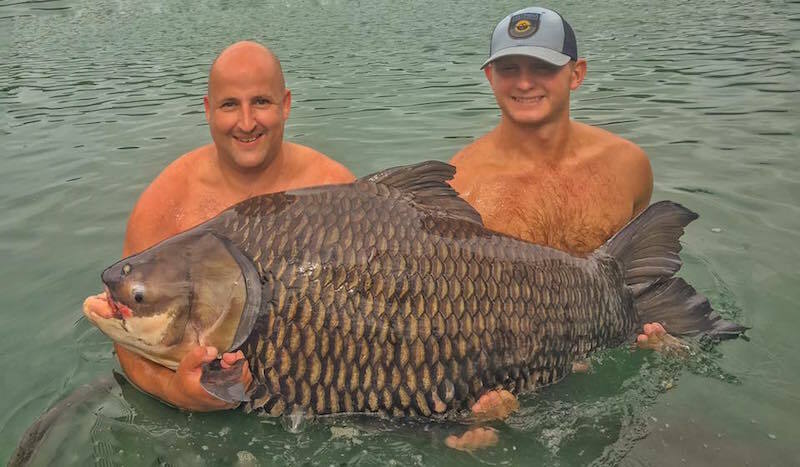 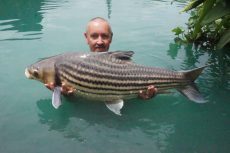 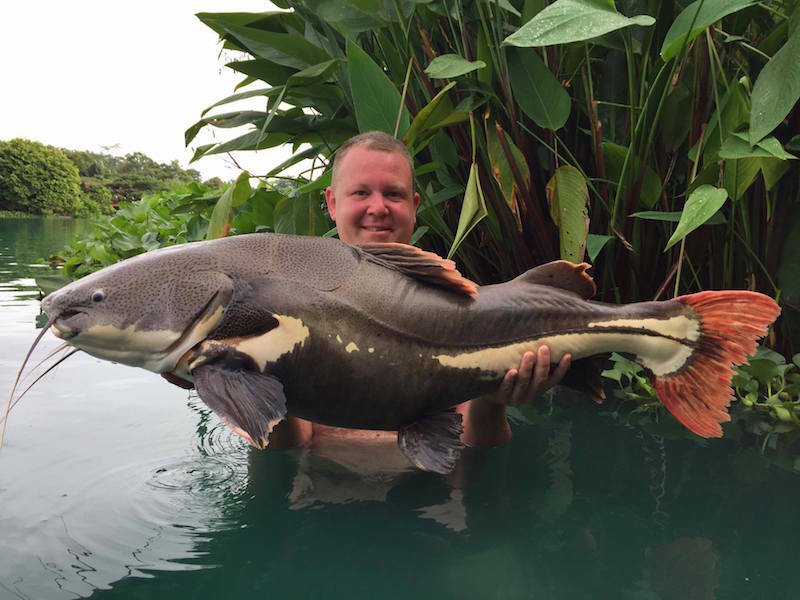 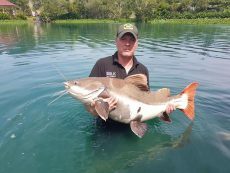 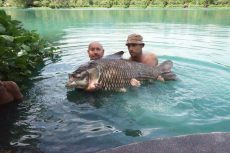 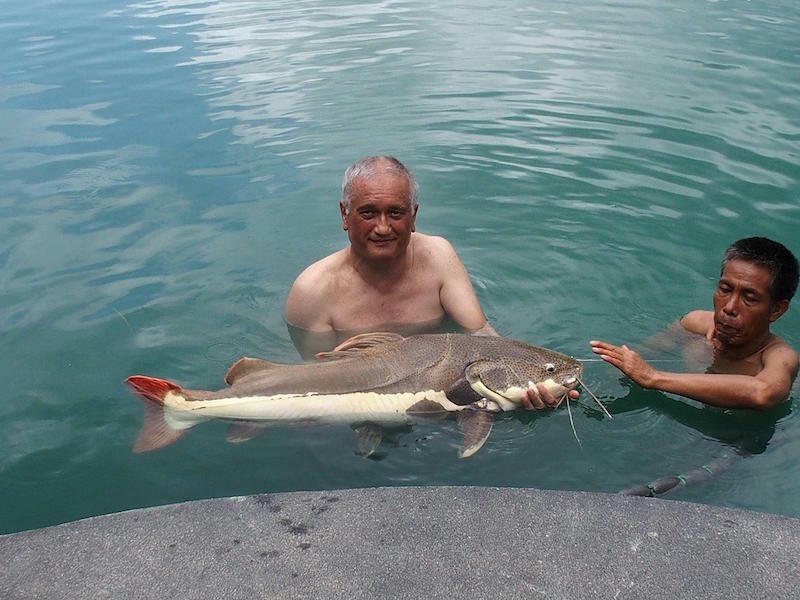 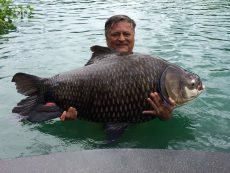 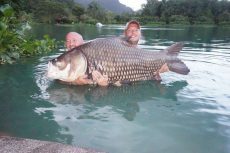 Dave was just a digit behind his wife with 11 fish of four species, and although he didn’t catch his arapaima, he did have some great fish including redtail catfish to 50lb, Julian’s carp to 40lb and his personal best Siamese carp of 105lb. David Williams and girlfriend Lindsey made their return trip to Gillhams after visiting two years earlier. 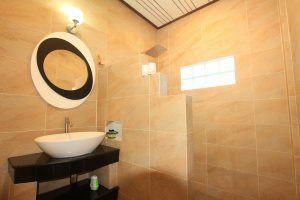 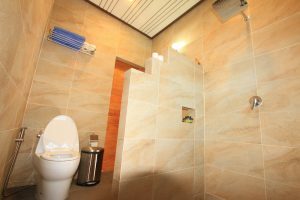 Dave is certainly a very keen angler and had booked ten days fishing with a fourteen night stay so that a couple of days could be left for sightseeing along with a nice surprise Dave had been planning. 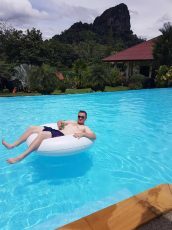 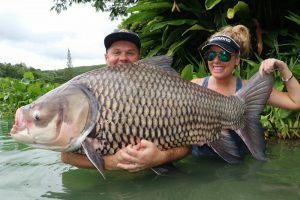 Once Dave had started fishing, that was it, he was in a zone and was just enjoying every minute of it just like Lindsey was having the some time to her self and relaxing around the pool. 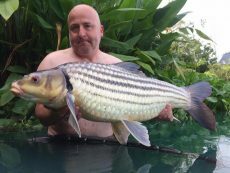 Dave done really well and his hard work certainly paid off and went on to landing some great fish. 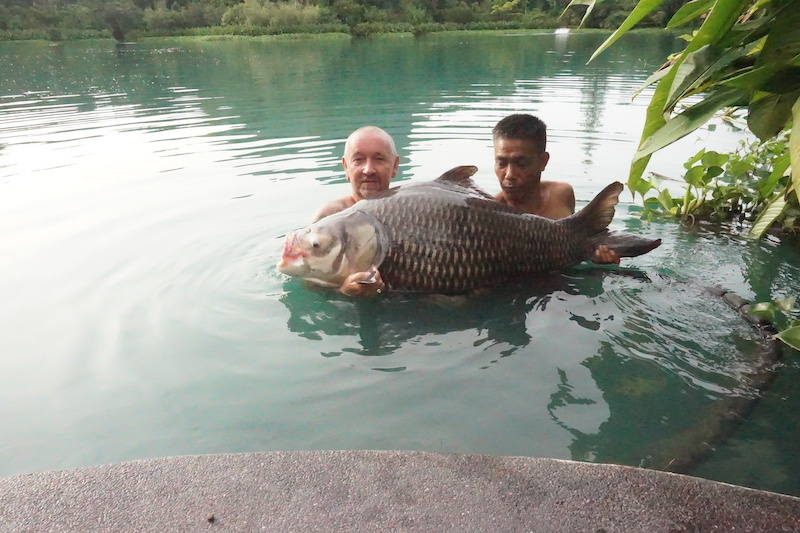 In total Dave caught 26 fish of seven species including three carp over a ton at 110lb, 126lb and 152lb. 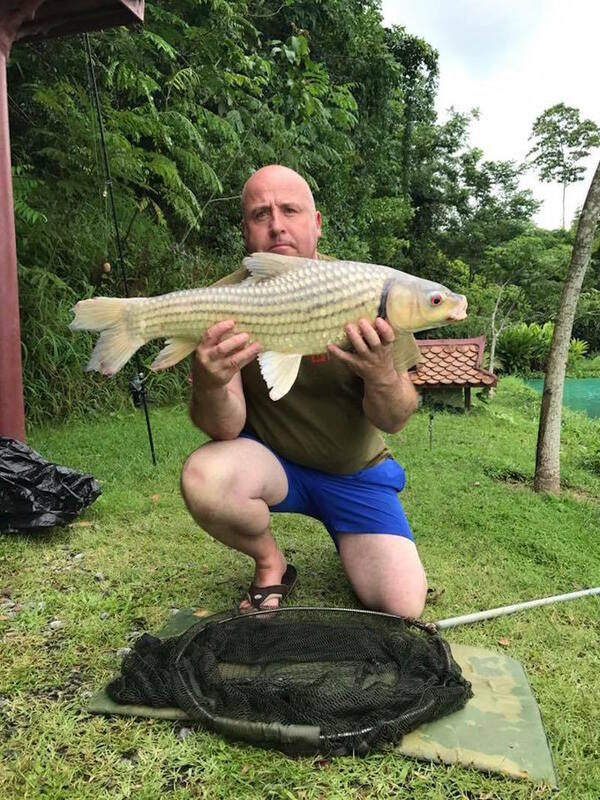 other species included Asian and Amazon redtails to 65lb, pacu to 20lb, Julian’s to 45lb, arapaima to 110lb and a cracking Hoven’s carp weighing 23lb. 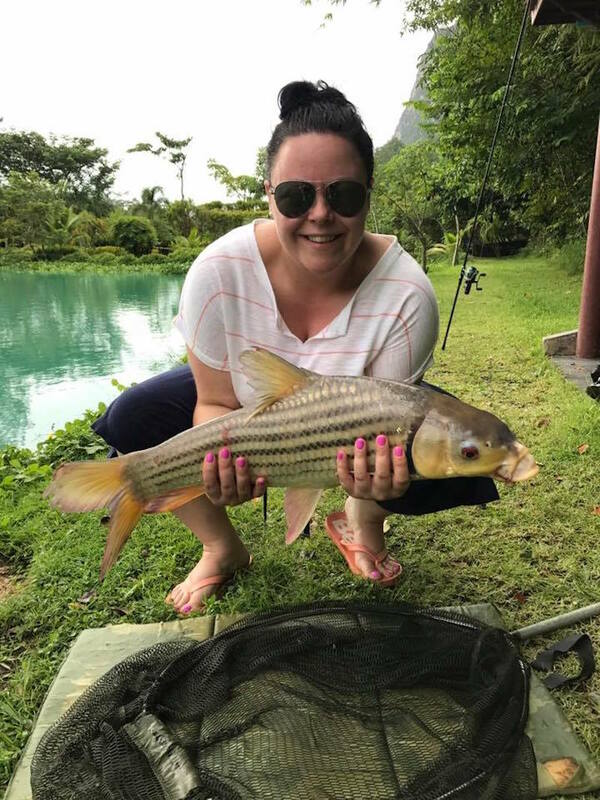 Once the fishing was over, it was time for some day trips with Lindsey with one of the days planned for a while to be Dave proposing to Lindsey while on a private boat trip to the islands. 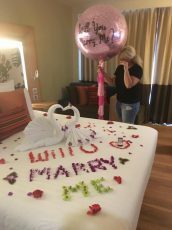 Obviously with the answer being yes, both Dave and Lindsey are now busy planning the wedding. 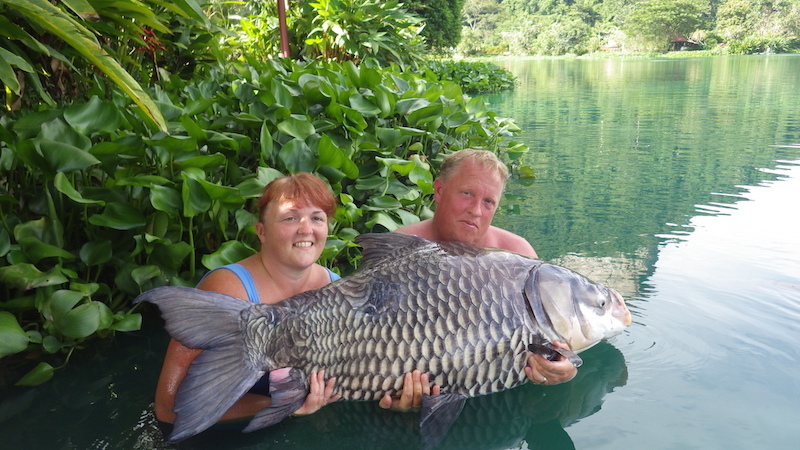 Everybody at Gillhams would like to congratulate Dave and Lindsey and wish you a very long and happy marriage. 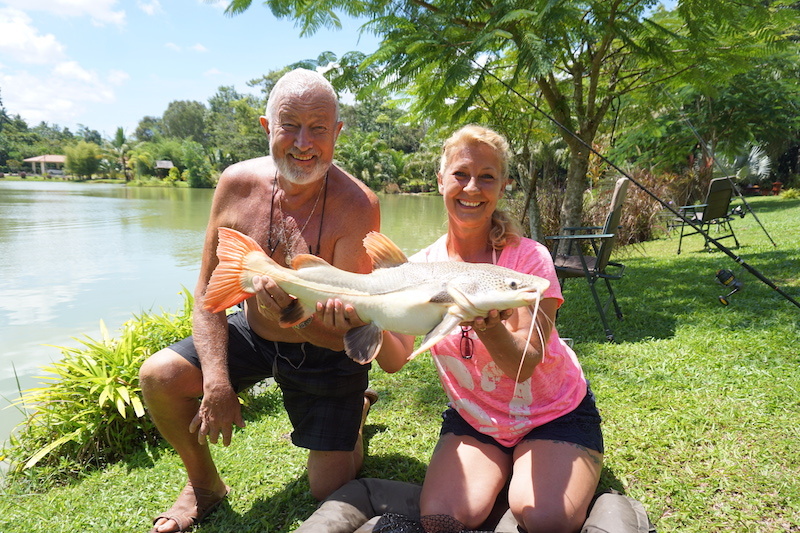 Next up was Jack Gardner along with his other half, Vicky, who had both been recommended to Gillhams by a very good friend, Terry Thompson (Terry No Legs). On arrival Jack was quick to get started while Vicky was quick to get shot of him and get round the pool. Jack fished A1 swim by the restaurant, and after building the swim up over a couple of days, he was soon getting into some nice fish. 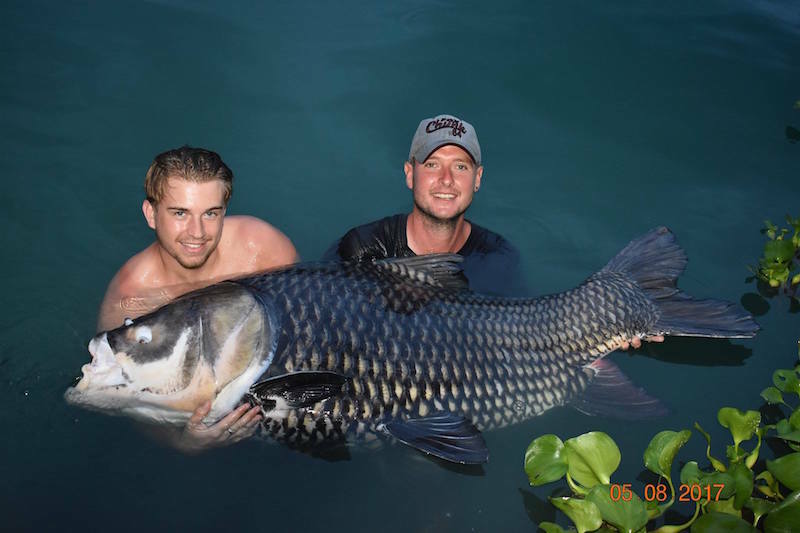 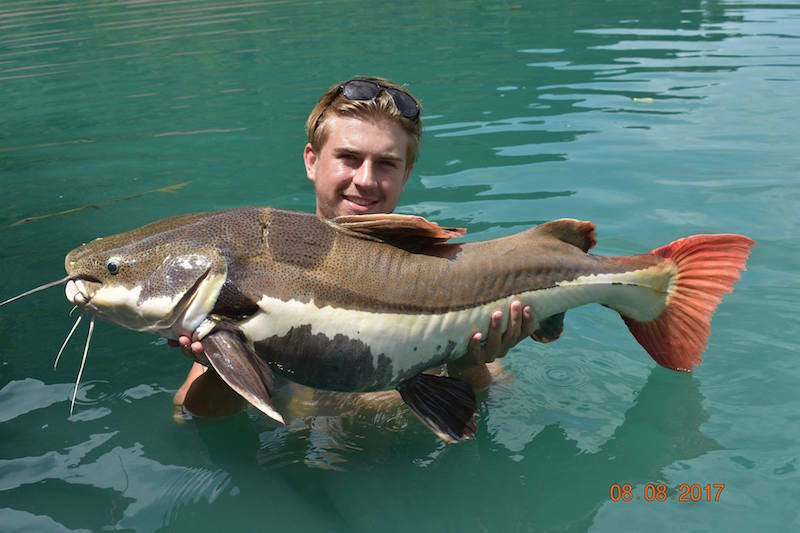 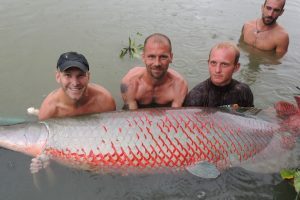 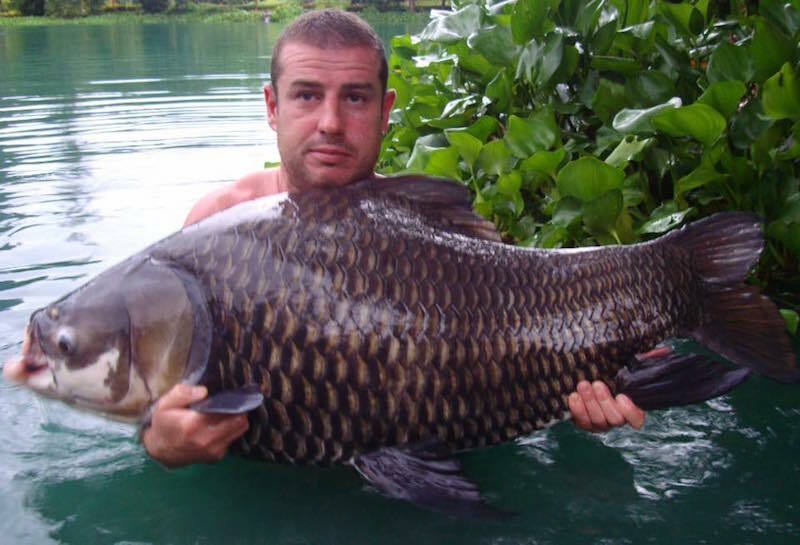 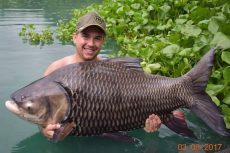 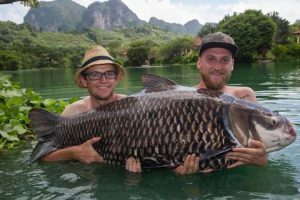 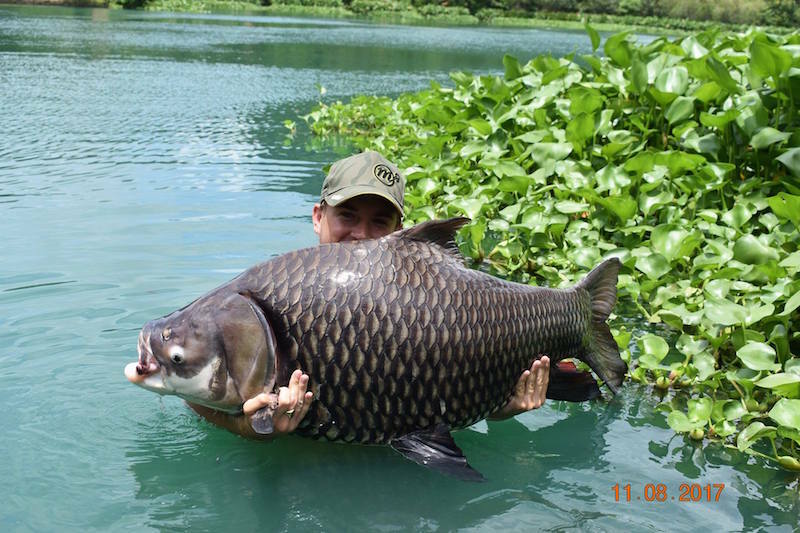 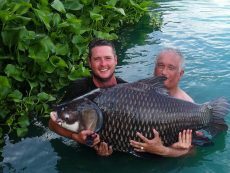 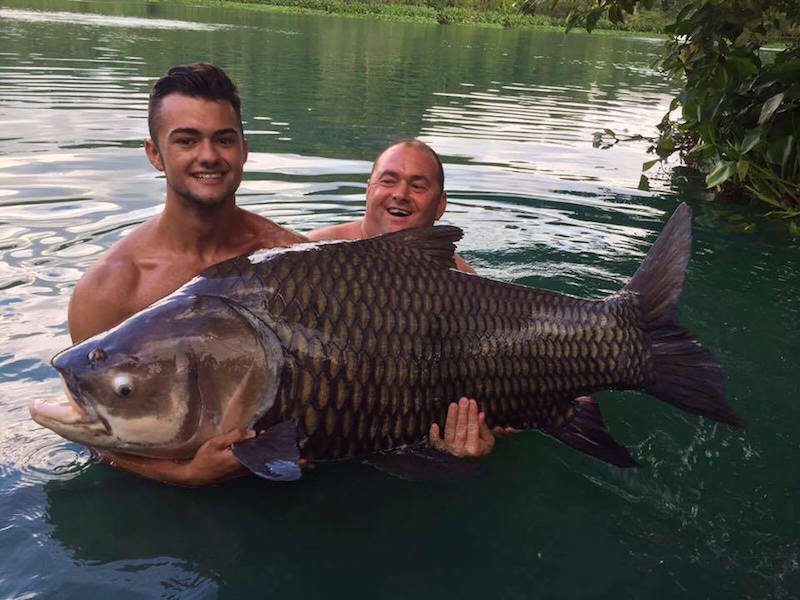 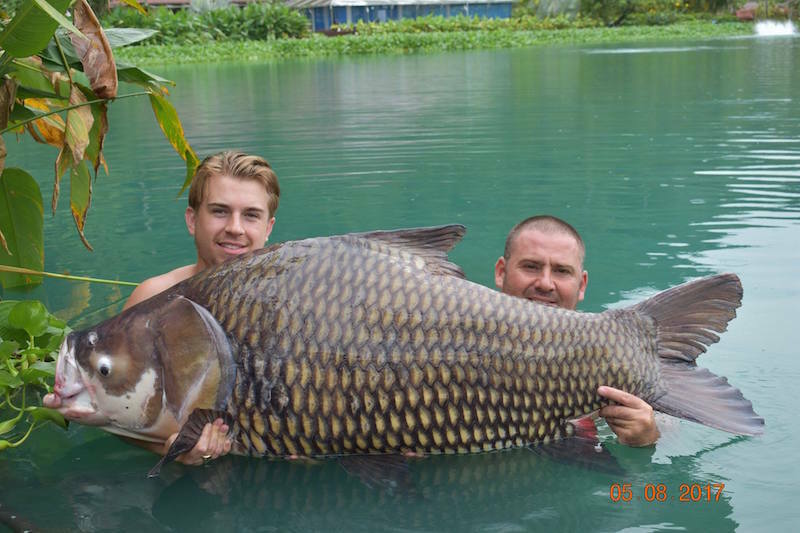 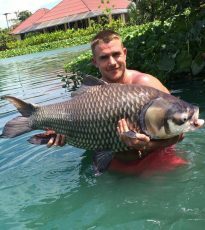 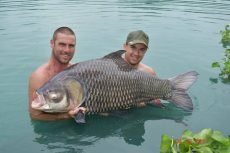 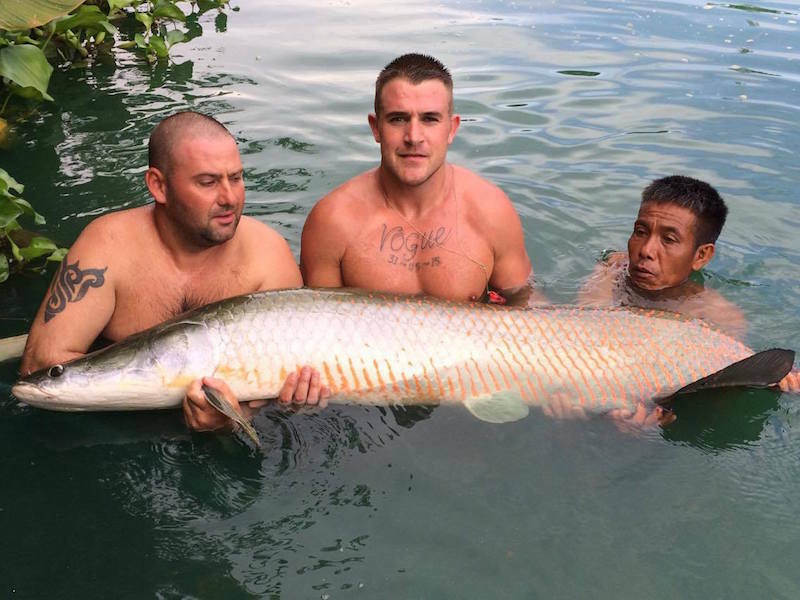 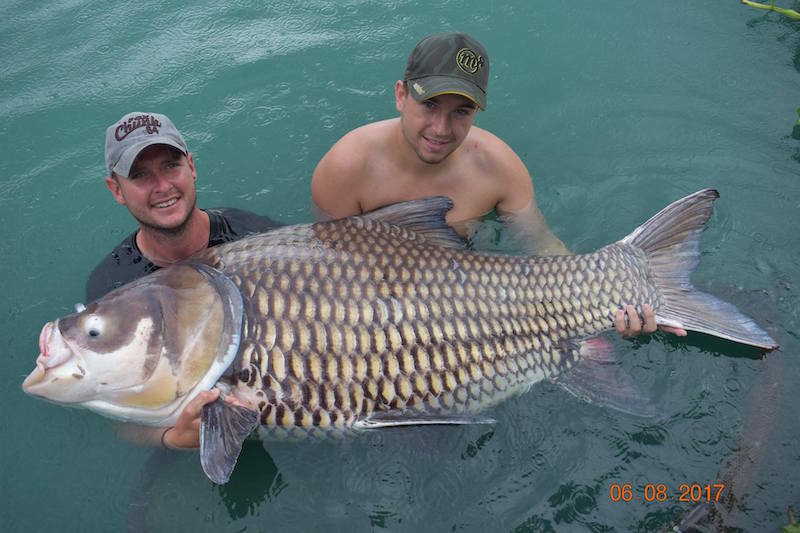 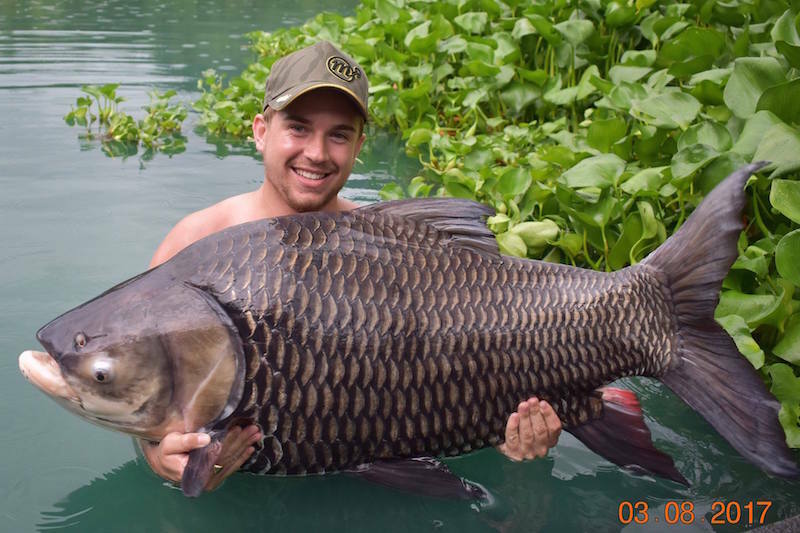 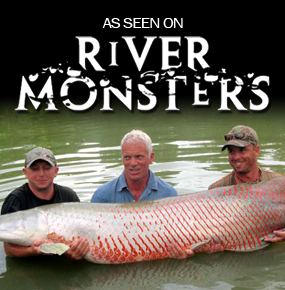 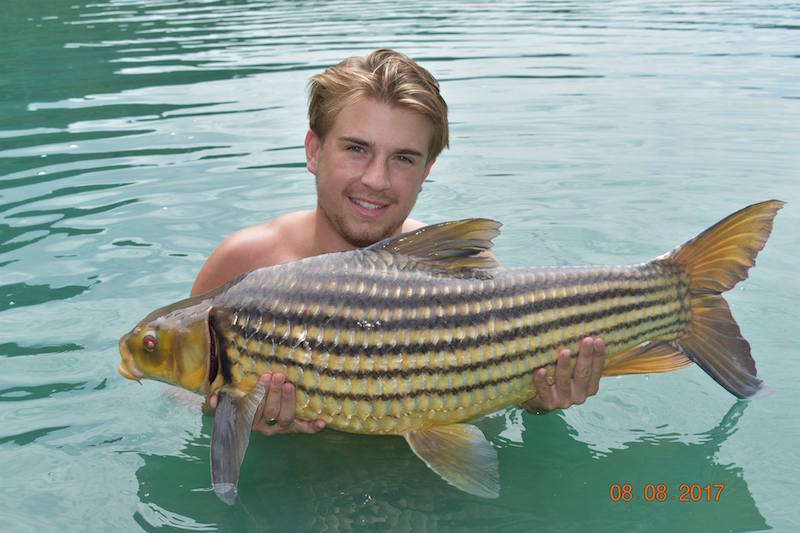 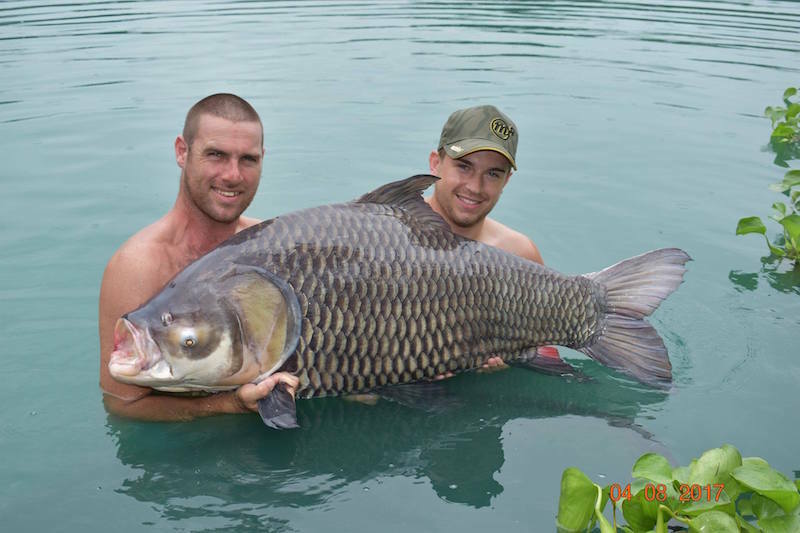 Two of Jack’s main target species were Siamese carp and arapaima, and Jack did well with both species. 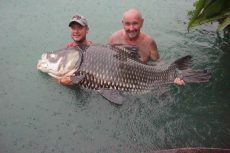 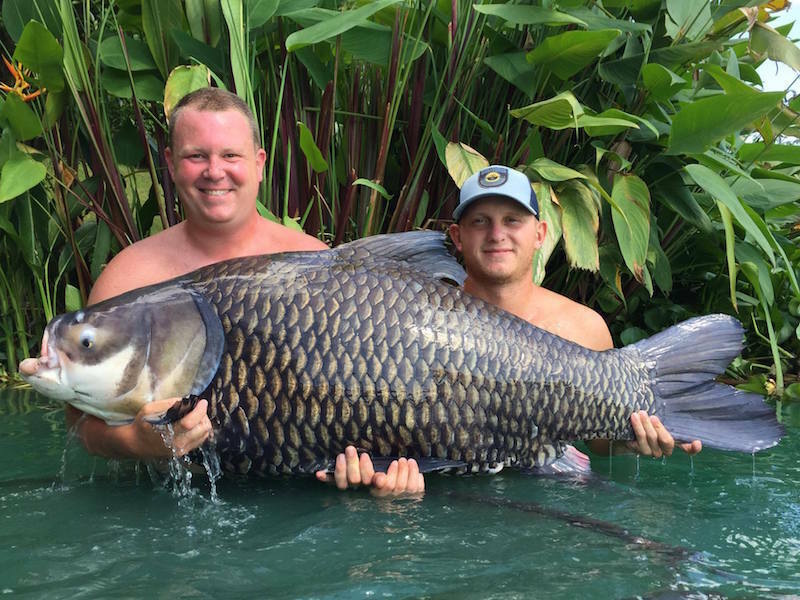 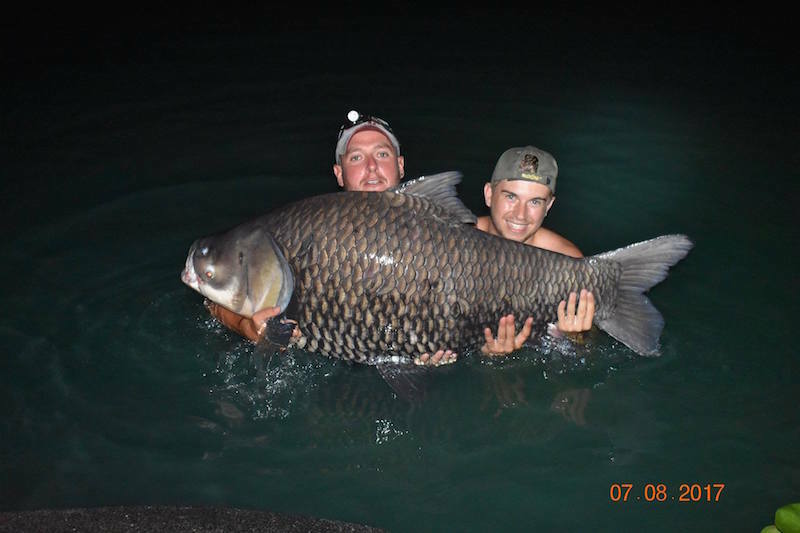 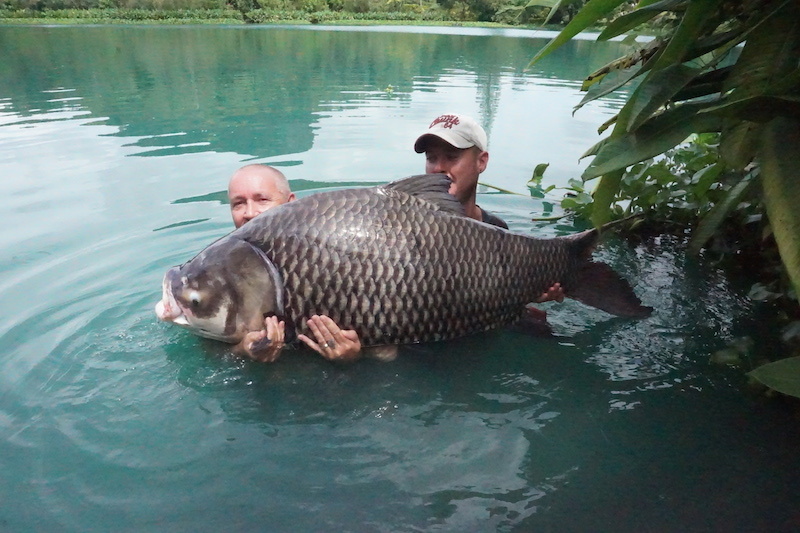 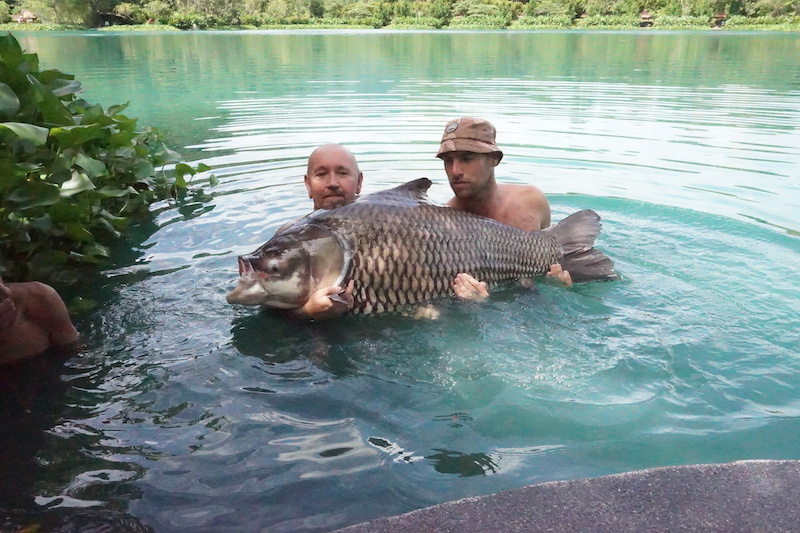 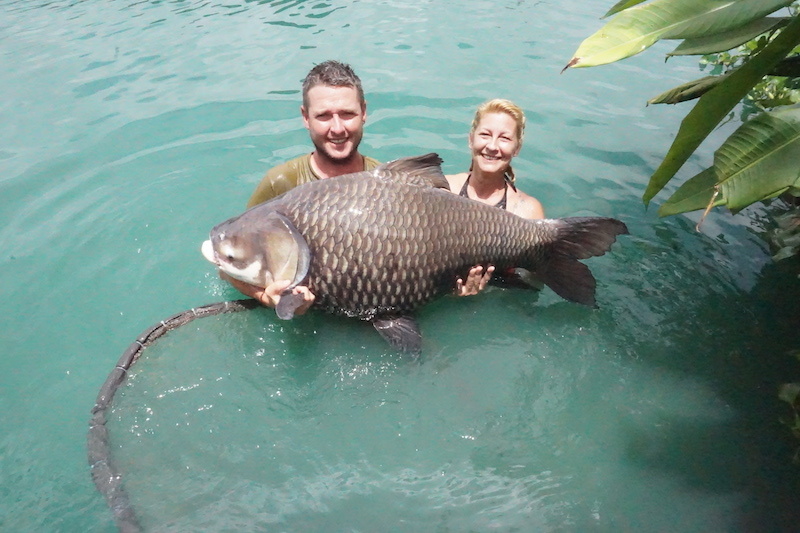 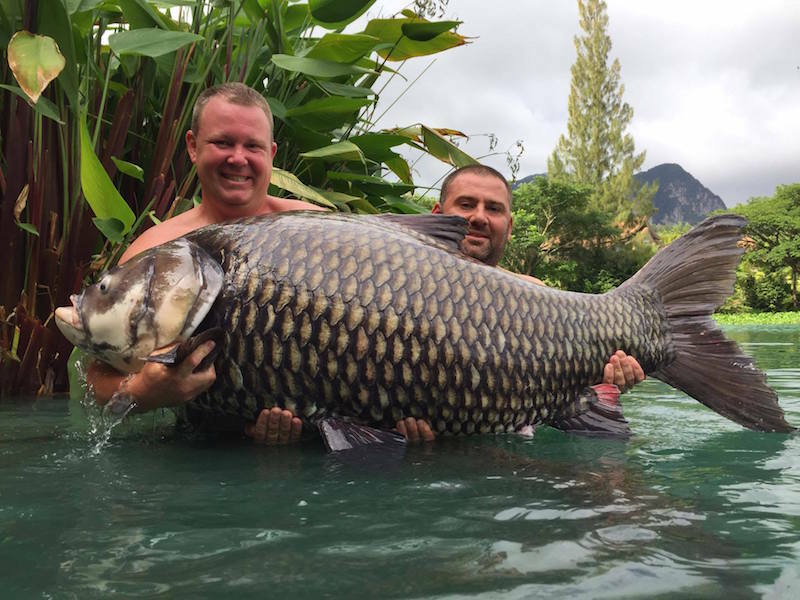 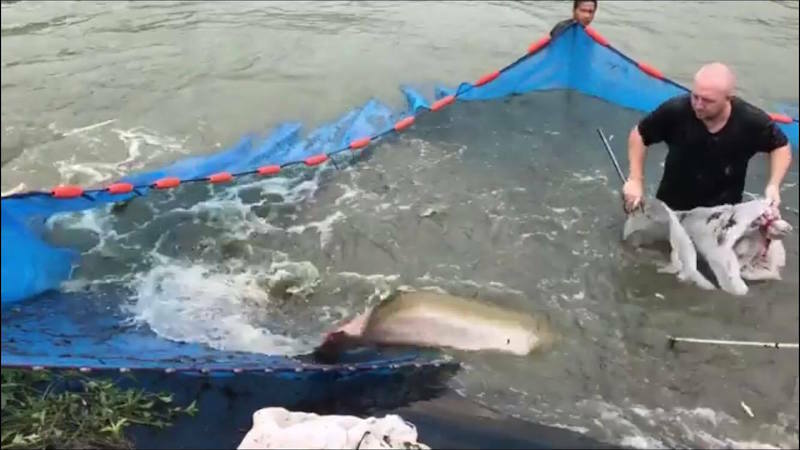 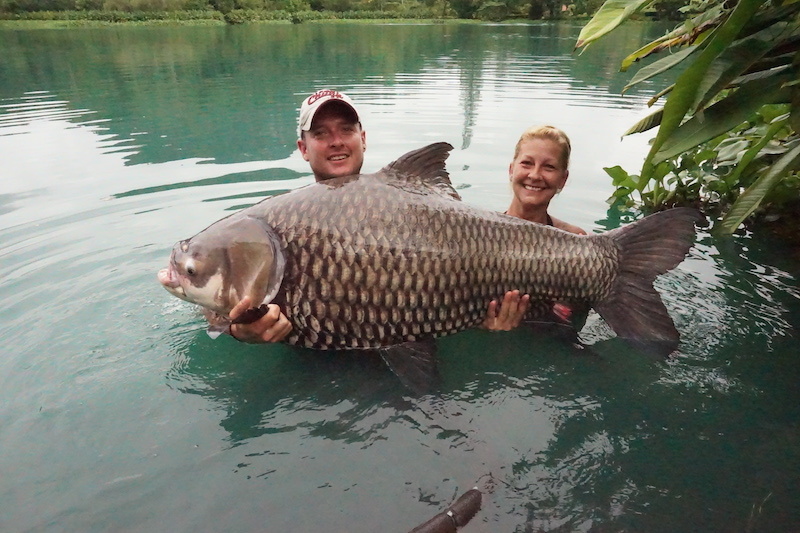 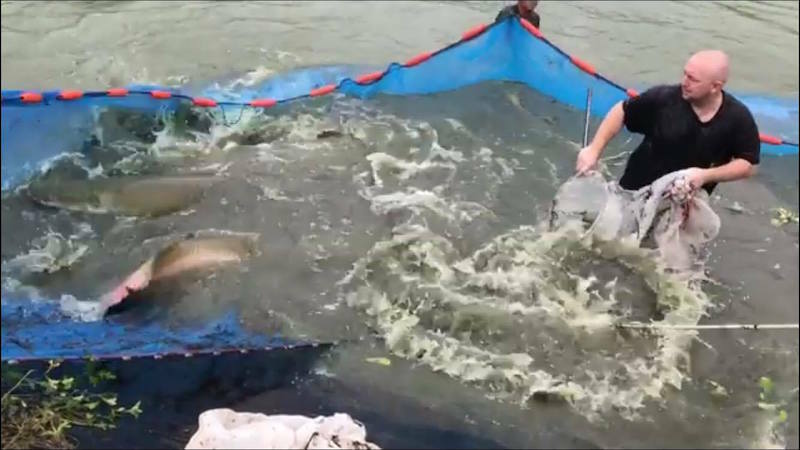 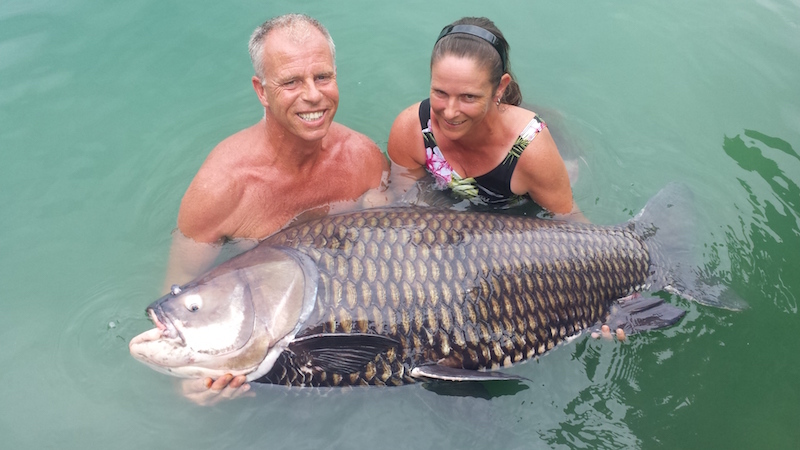 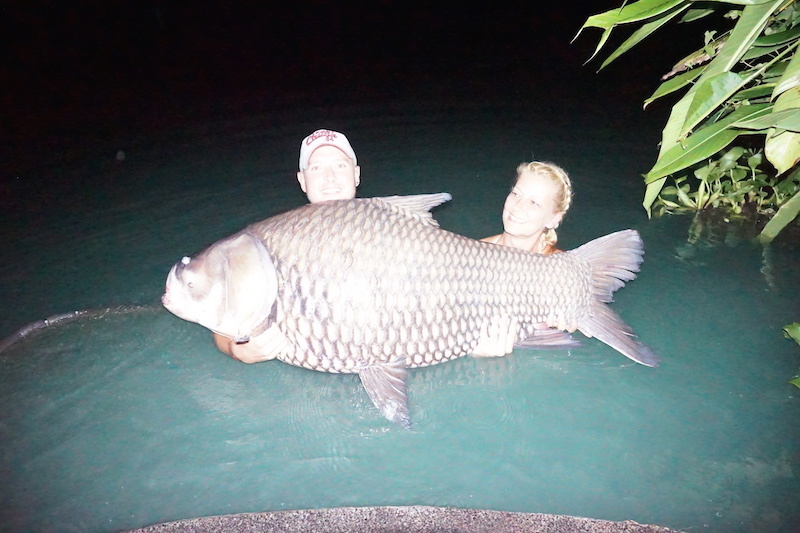 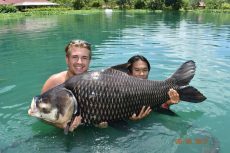 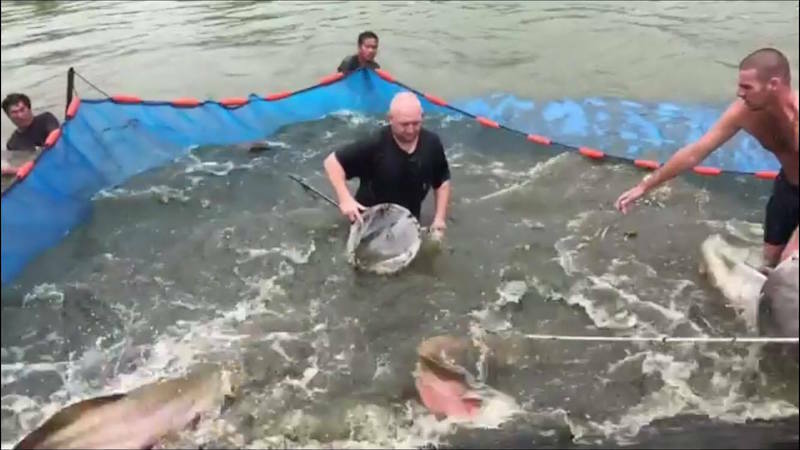 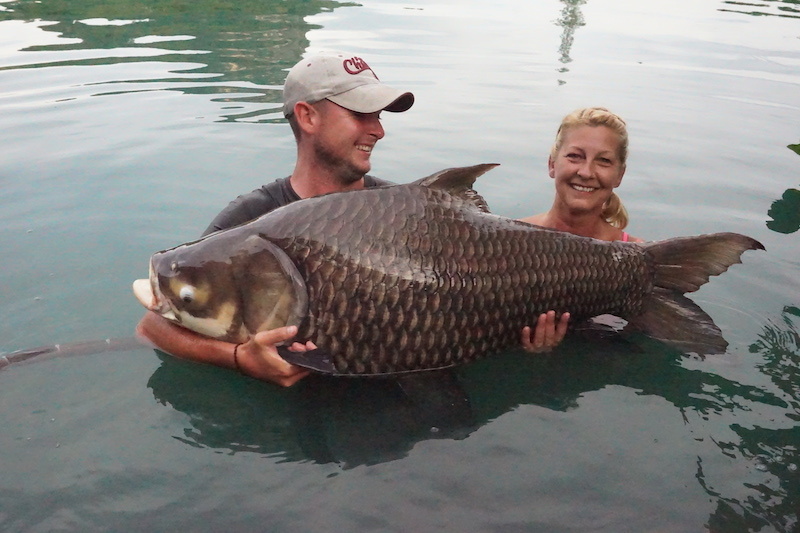 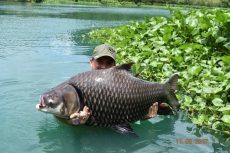 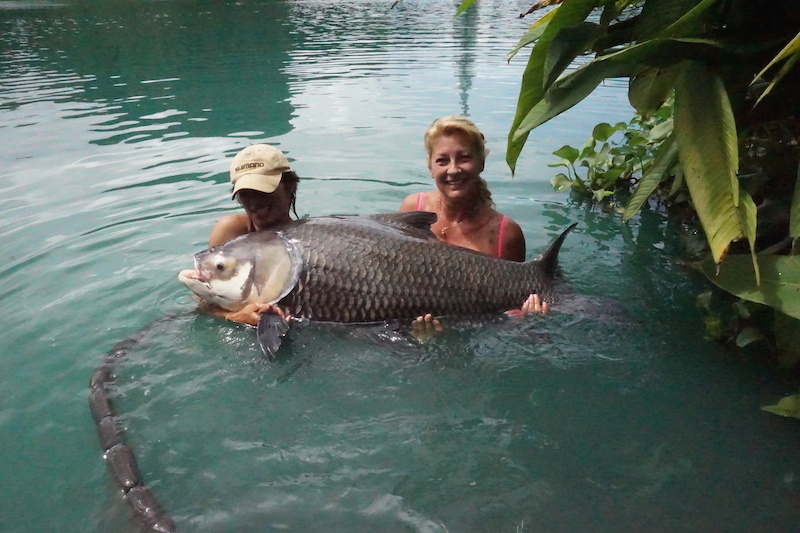 Throughout Jack’s stay, he landed 19 Siamese carp with six over a ton: 105lb, 110lb, 120lb, 136lb, 155lb and 172lb. 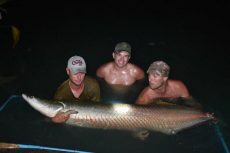 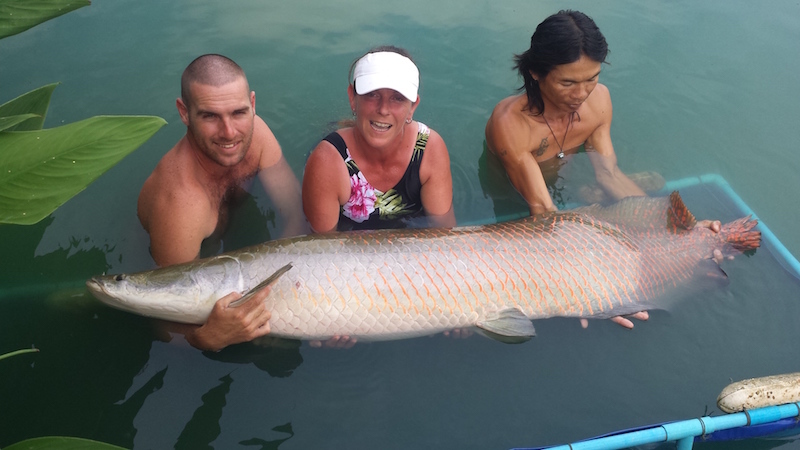 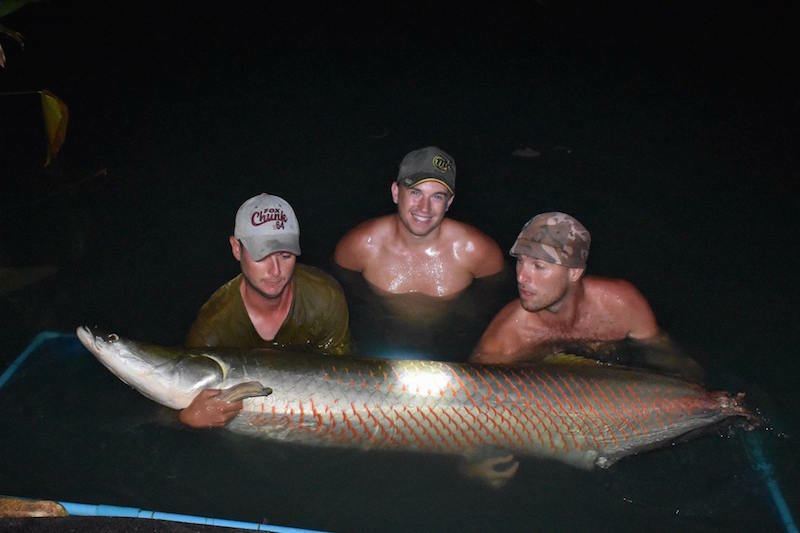 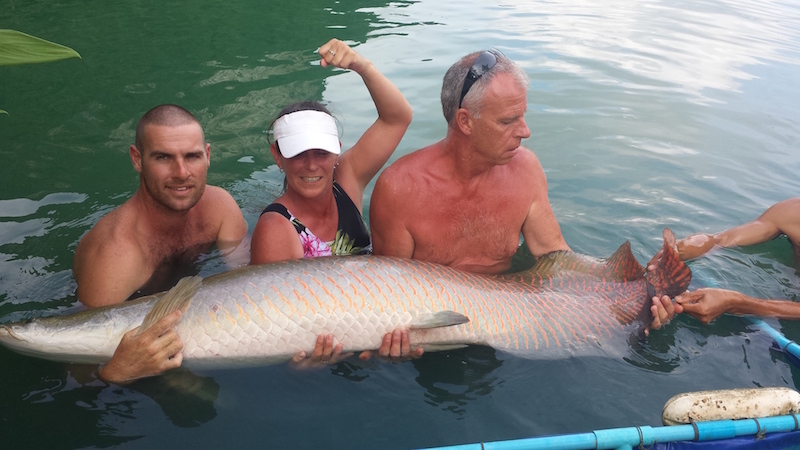 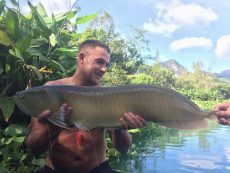 Jack also did well with the arapaima, landing three estimated at 150lb, 300lb and 400lb. 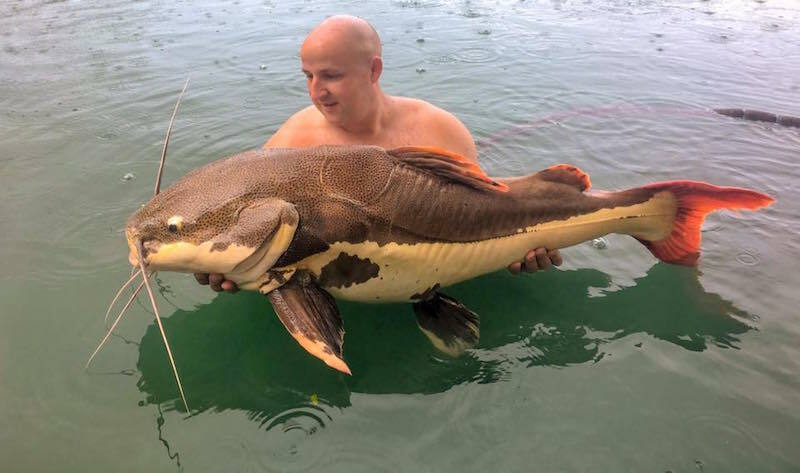 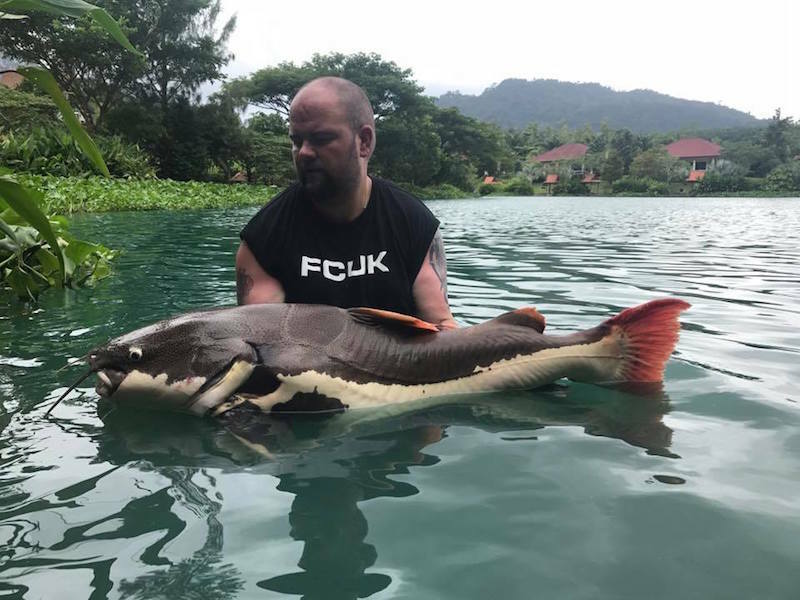 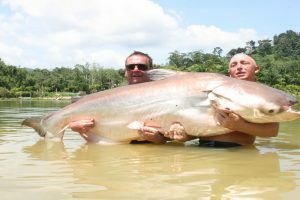 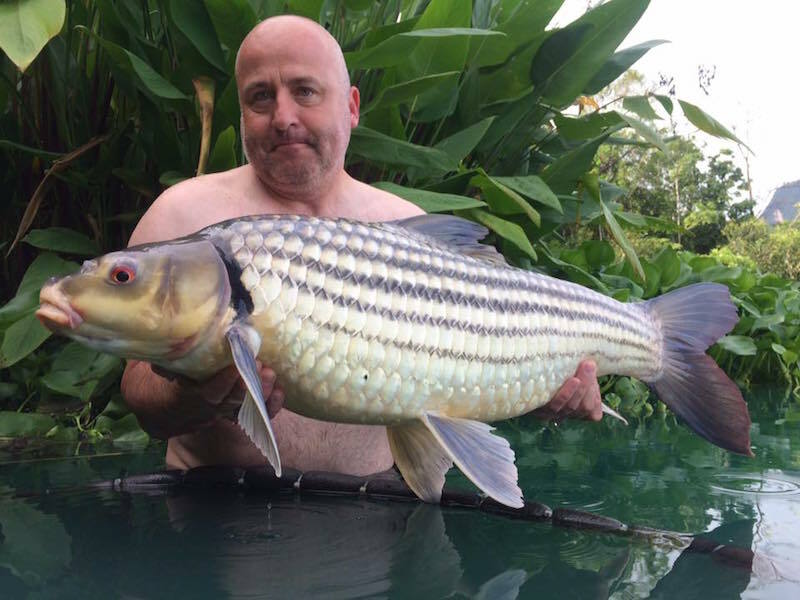 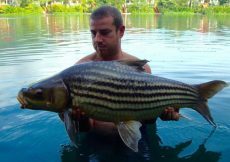 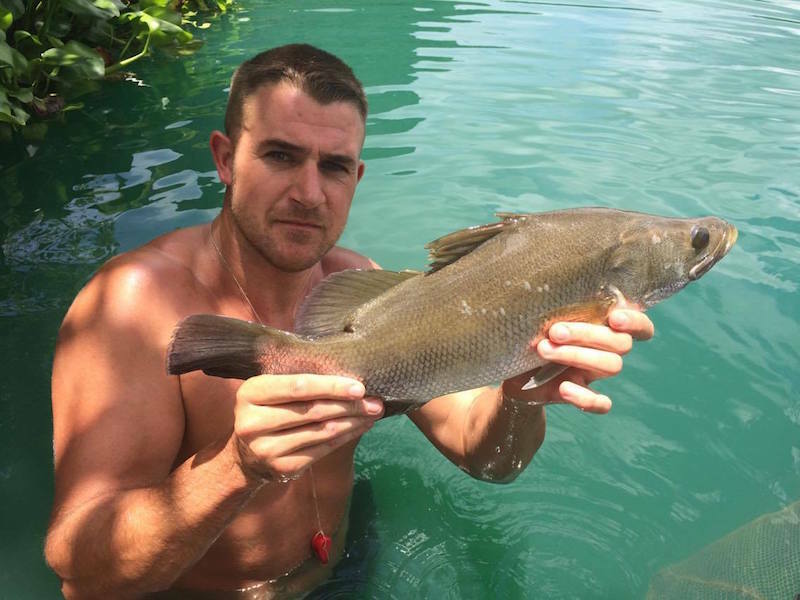 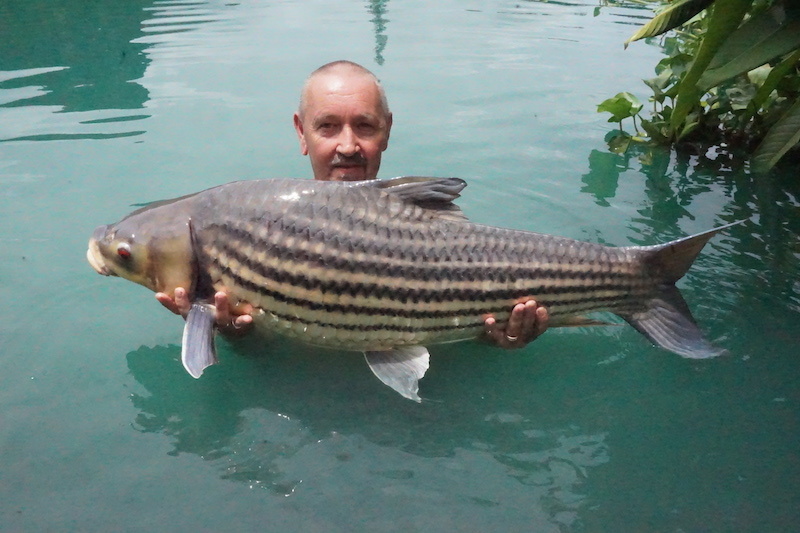 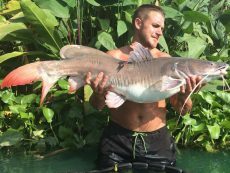 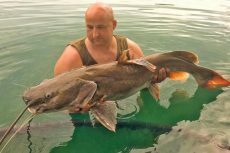 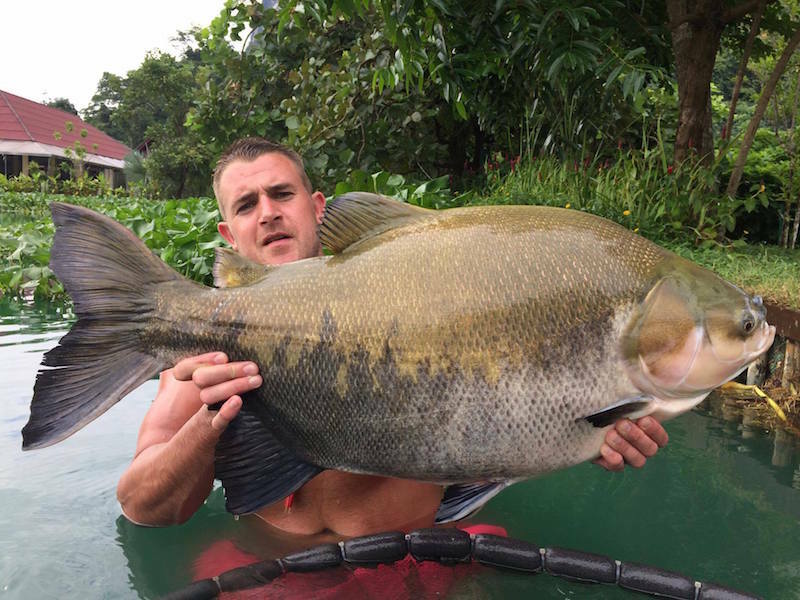 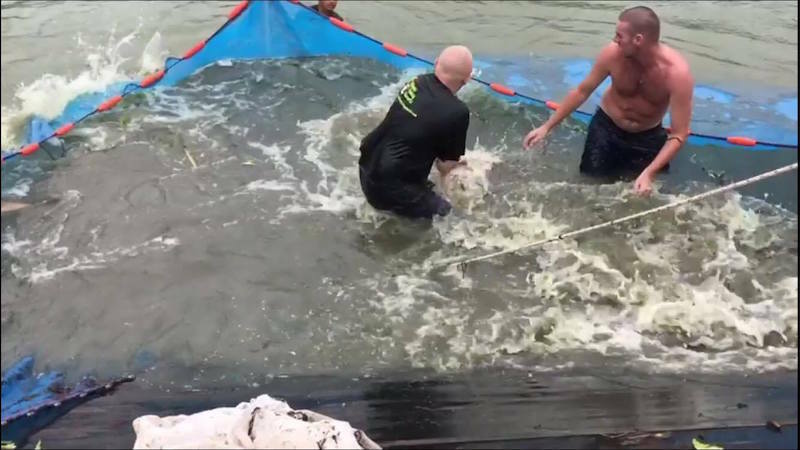 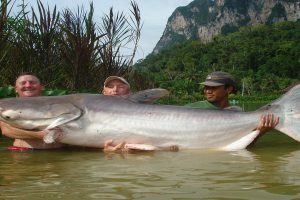 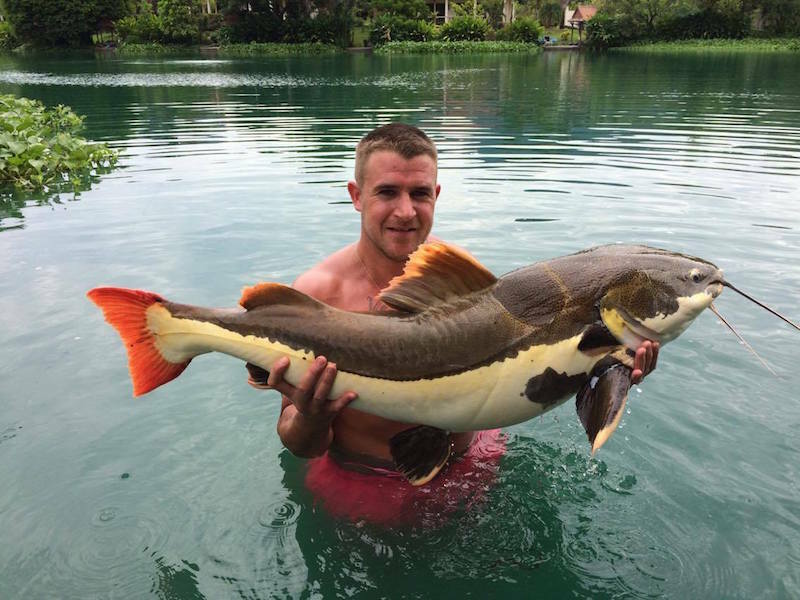 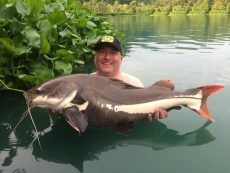 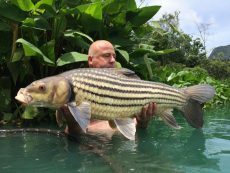 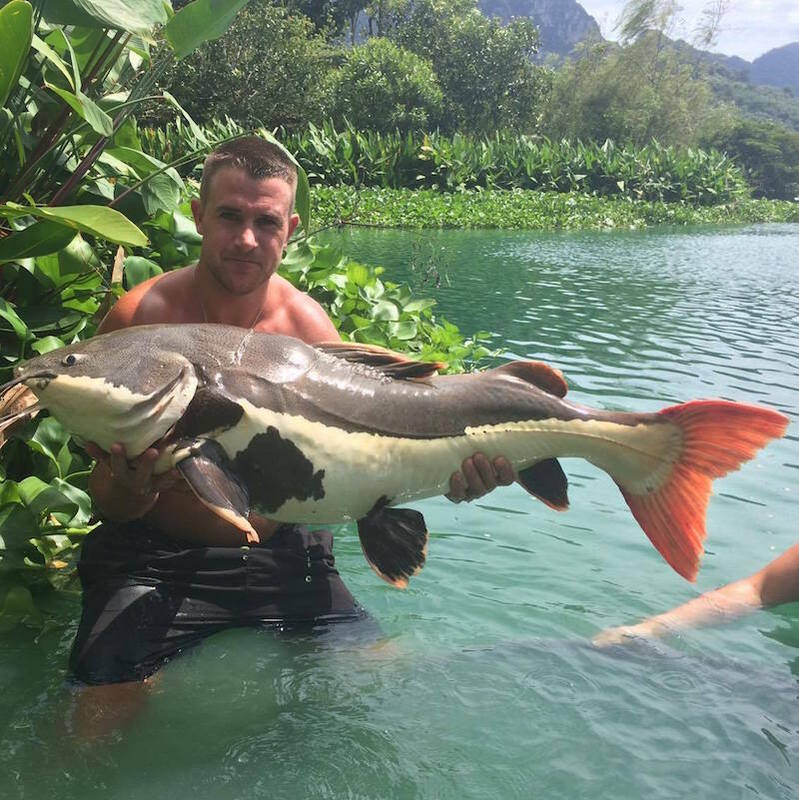 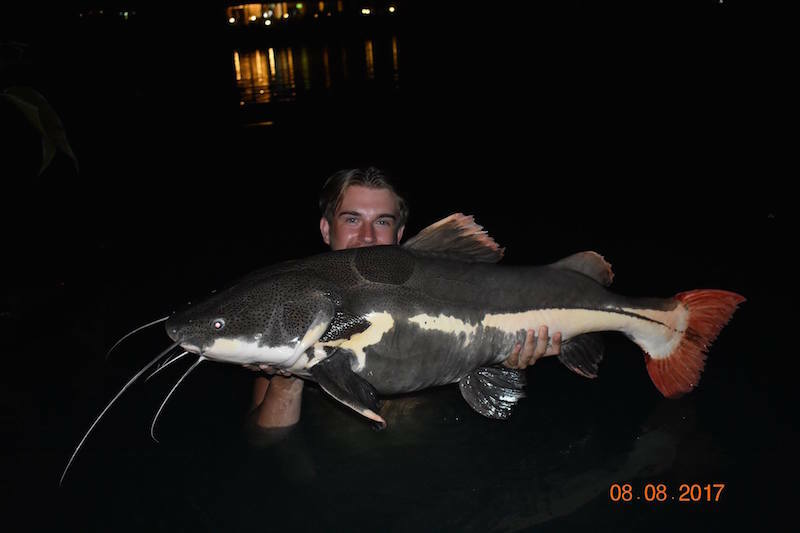 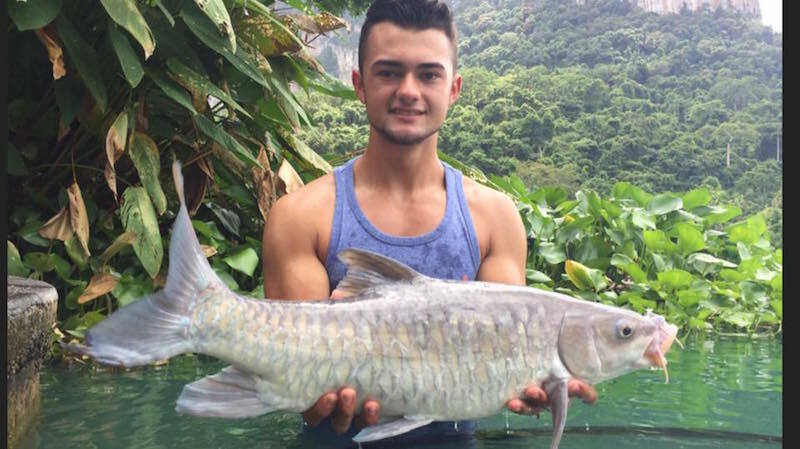 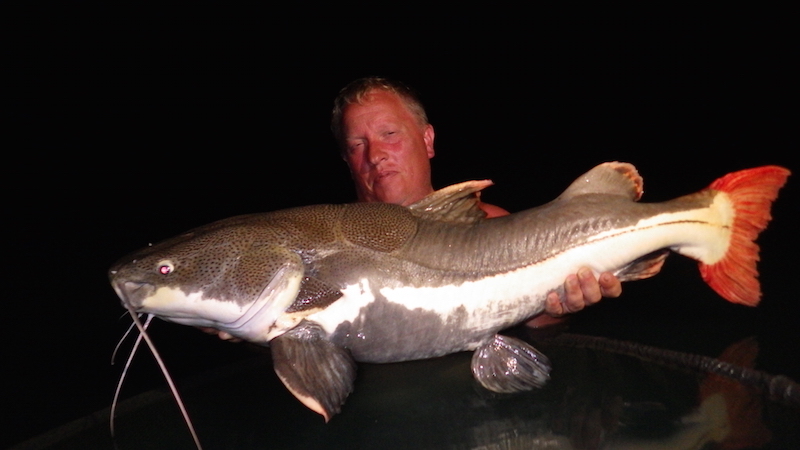 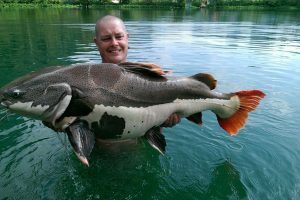 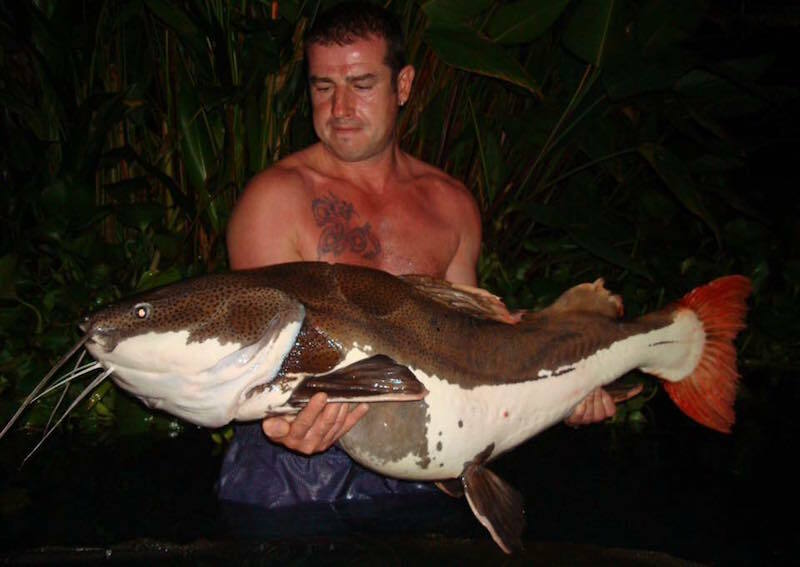 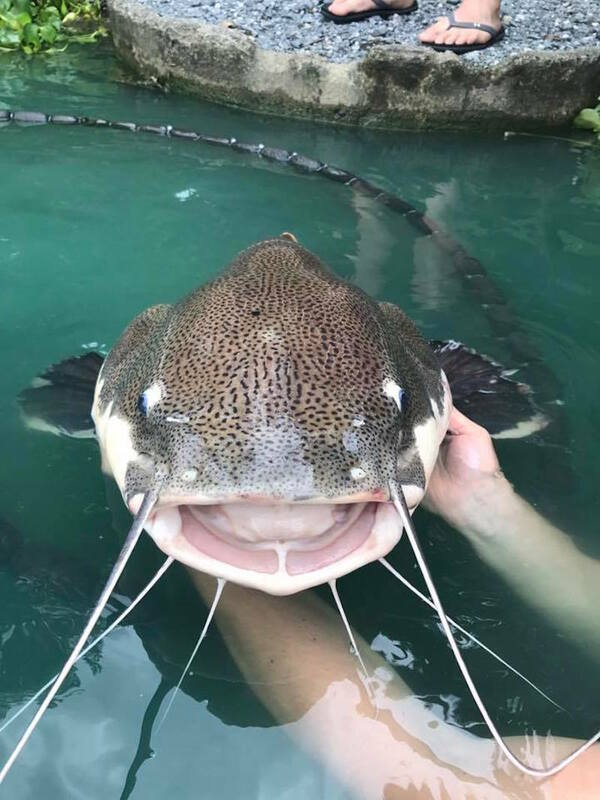 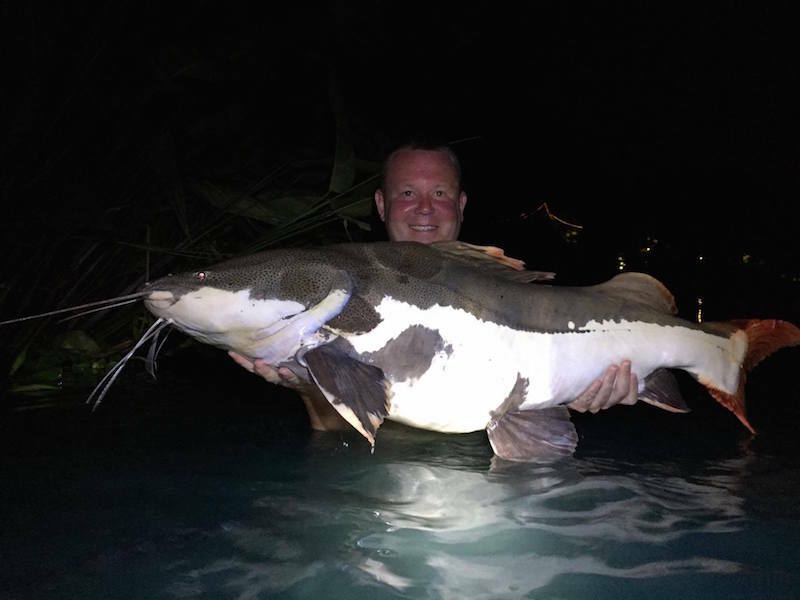 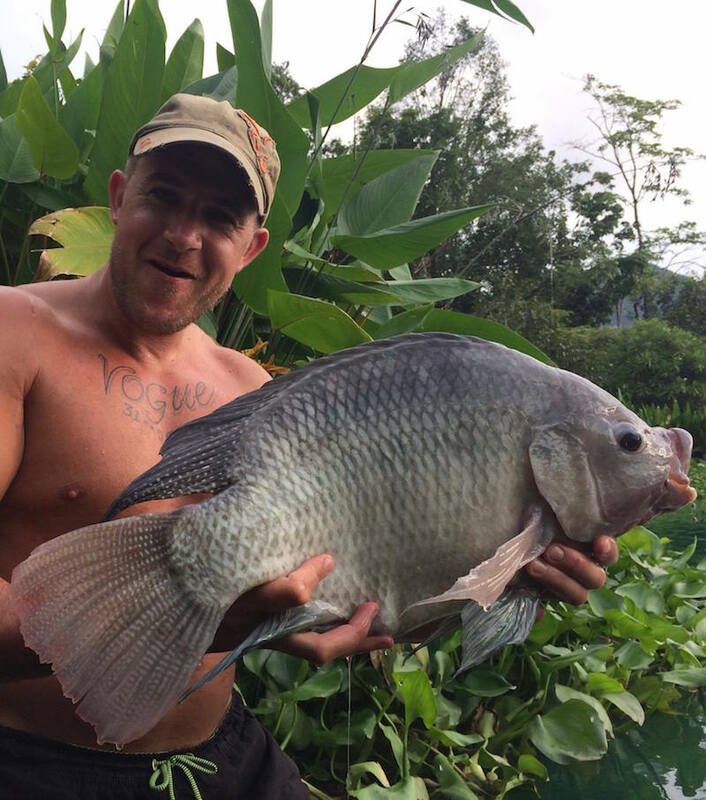 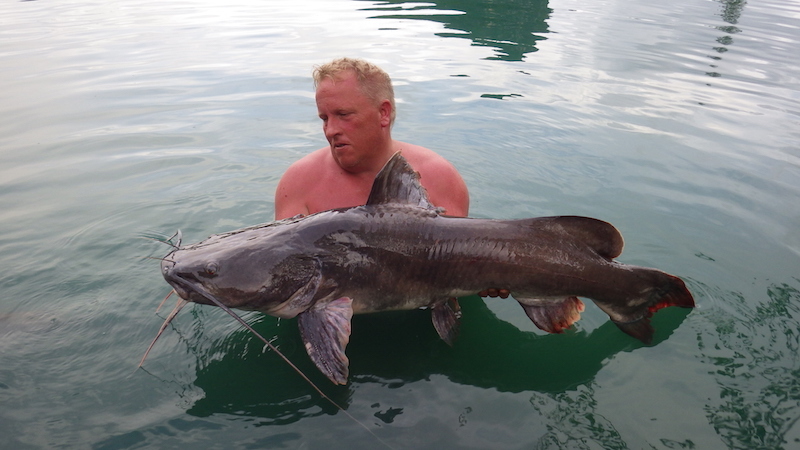 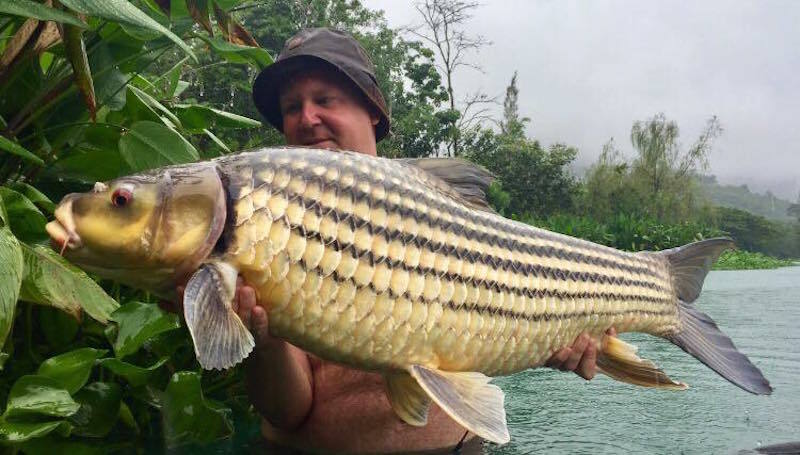 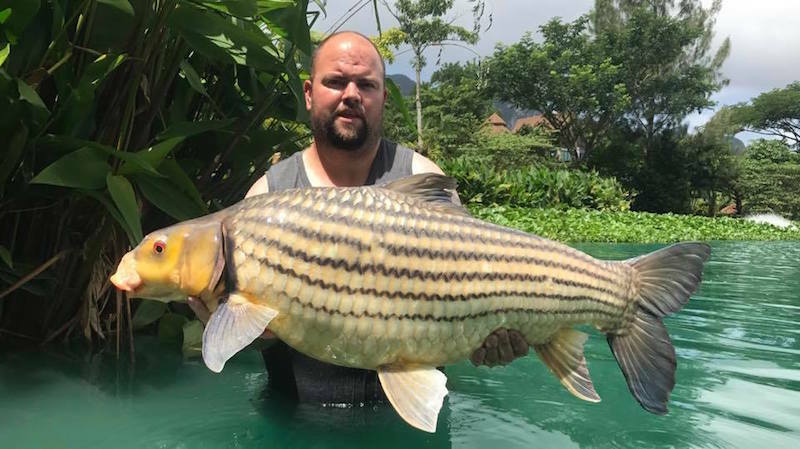 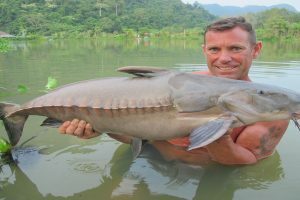 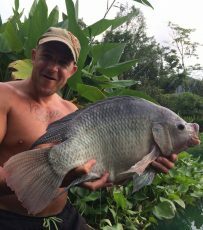 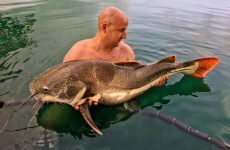 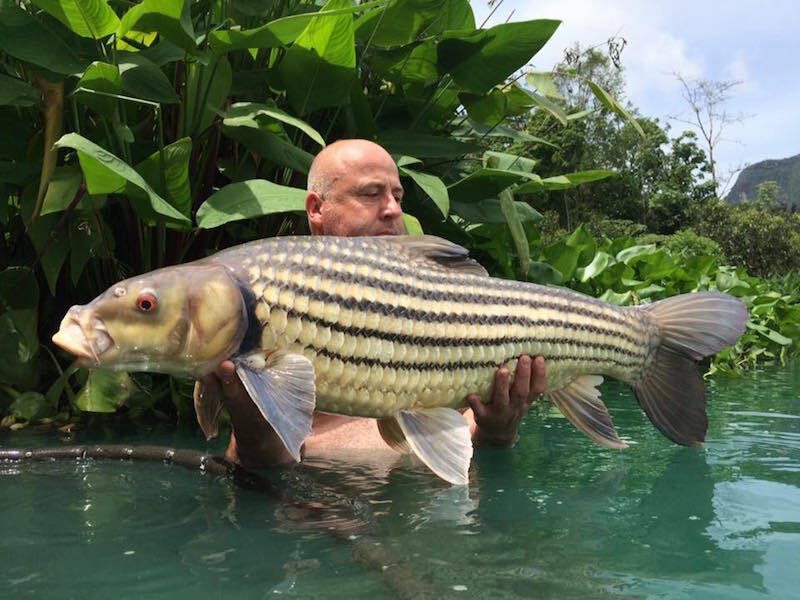 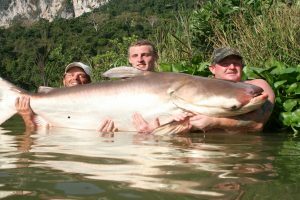 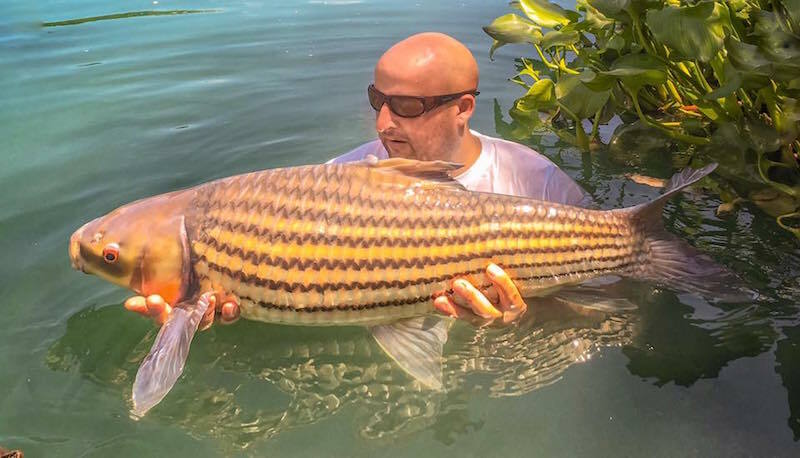 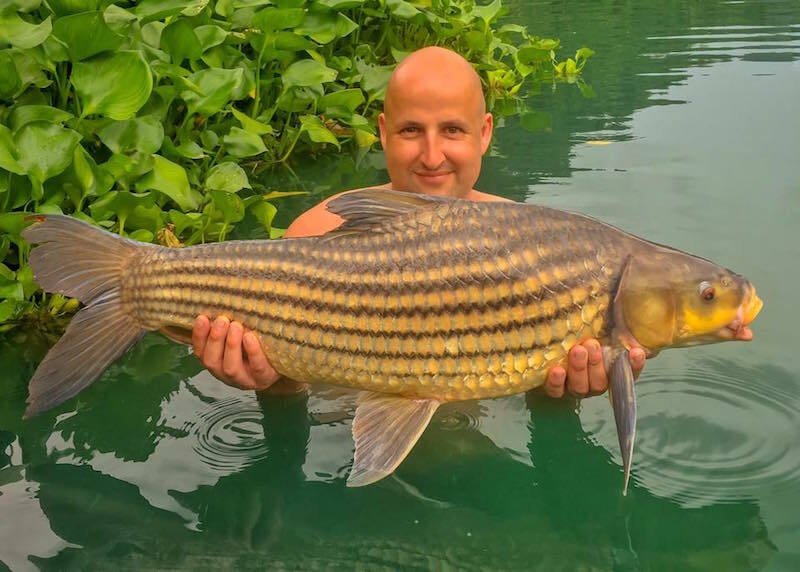 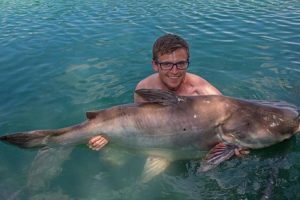 In total Jack caught 33 fish of seven species and also managed to land a third ton-up species when he caught a cracking Mekong catfish estimated at 210lb. In between fishing, Vicky did manage to get Jack on a couple of day trips and also had some nights on the town with other couples at the resort. 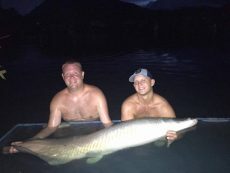 Mark Luckman made another return trip this month along with Craig Diamond and his other half, Toni. 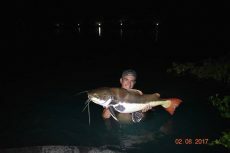 The guys were quick to get into their fishing and went on to land some nice fish. 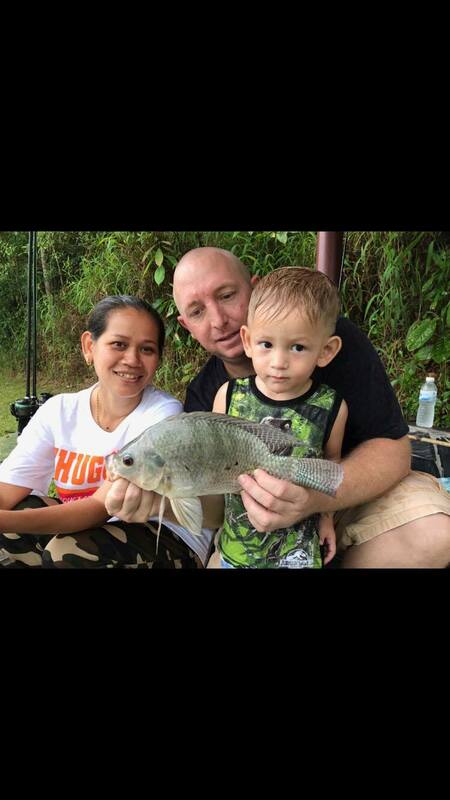 Craig took a few breaks from fishing so that he could spend time with Toni. 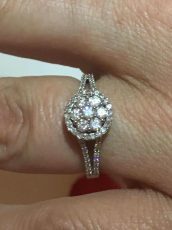 During in one of their trips to the Emerald Pools and hot springs, Craig got down on one knee and proposed to Toni. The things we do to keep the missus happy so we can go on fishing holidays! Congratulations, guys… we’re really happy for you both and will look forward to seeing you on your honeymoon. 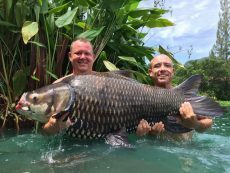 Mark and Craig both went on to catch some great fish including Amazon redtail catfish, Mekong, pacu, Julian’s, barramundi and arapaima. Dean and Jenni Handley made another trip out here to their home away from home and like always fished hard and caught well. Dean and Jenni always double up in a swim and fish together, taking it in turns on the fish. 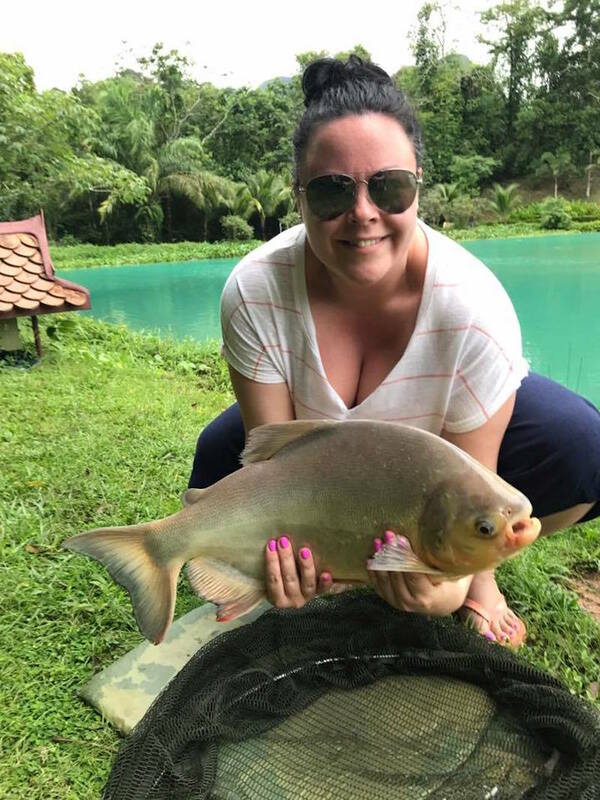 This trip was all about the carp, and even though Dean and Jenni love catching different species, the carp are always high on the list. 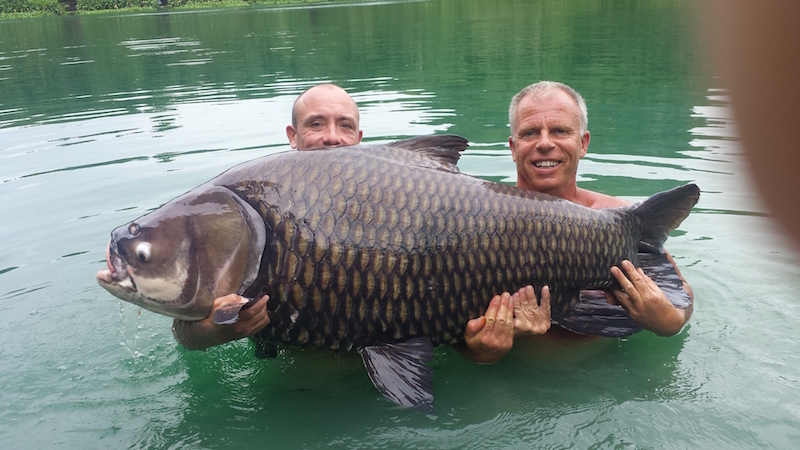 In total they landed 31 Siamese between them with nine over the magical 100lb mark with the biggest at 170lb. 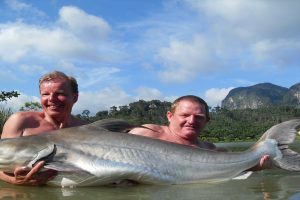 During their stay, Stuart had booked in for a coupe of days at John Wilson’s lake, as Dean and Jenni had always talked about meeting him one day after following him for years on the TV. 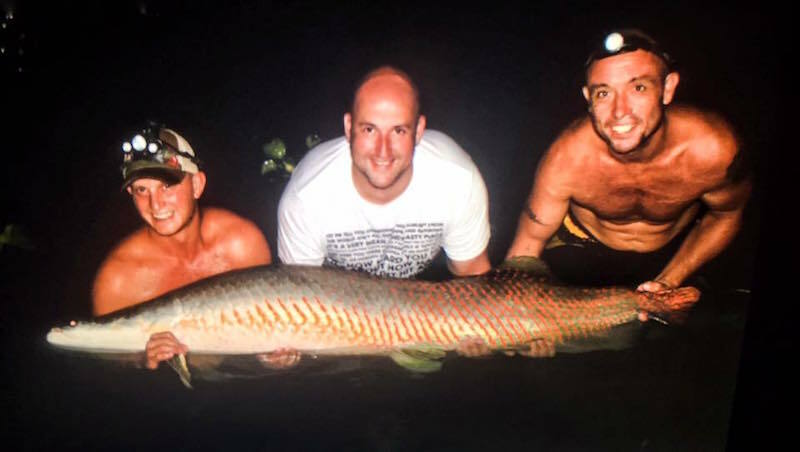 While down at John’s, they both caught some great fish including a couple of big Amazon redtails and a cracking looking arapaima before heading back here for their last few days. 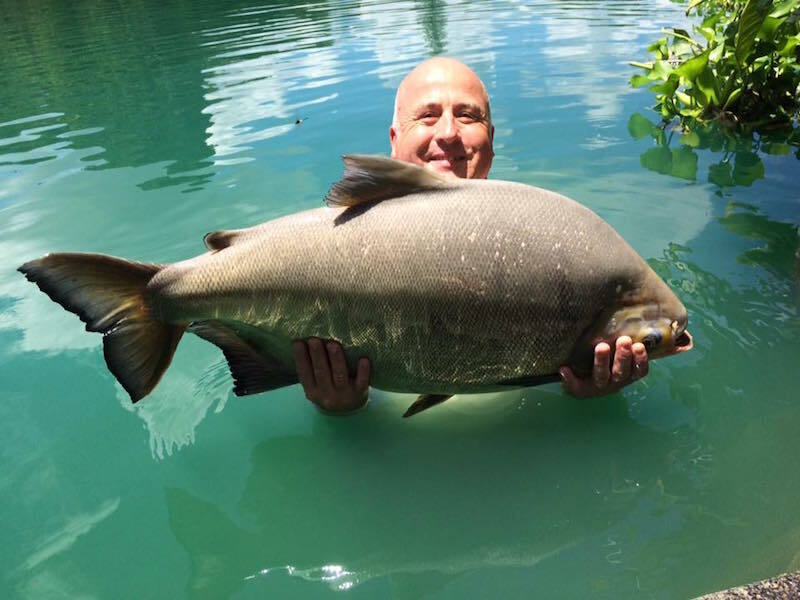 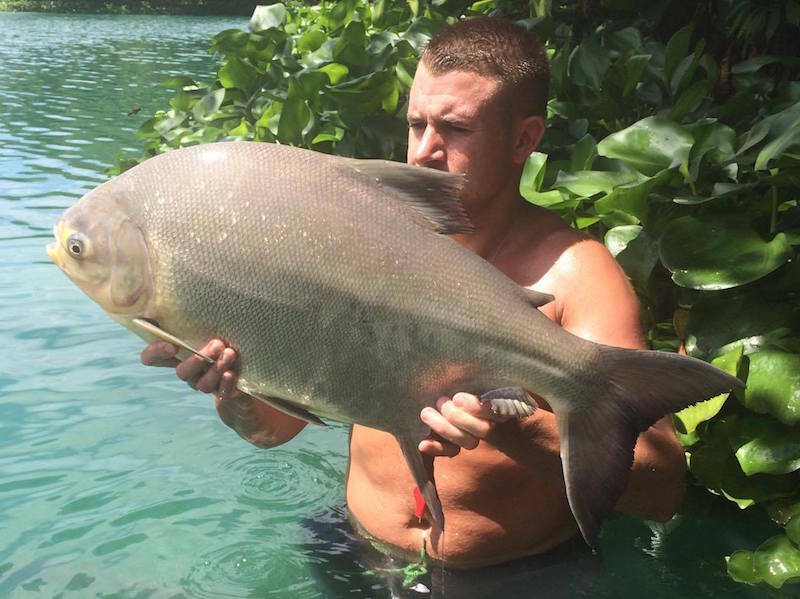 Their total fish caught here at Gillhams were 48 fish of seven species, including Julian’s, Asian and Amazon redtails, Nile perch, tilapia and a cracking 45lb black pacu. Next up was first-timers to Gillhams, Paul Hogg and his wife Dawn along with their friends, Kim Slee and his wife Tracy, who booked this trip after coming and seeing us at the Brentwood show in Essex earlier this year. 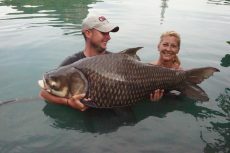 Both couples are fishing mad. 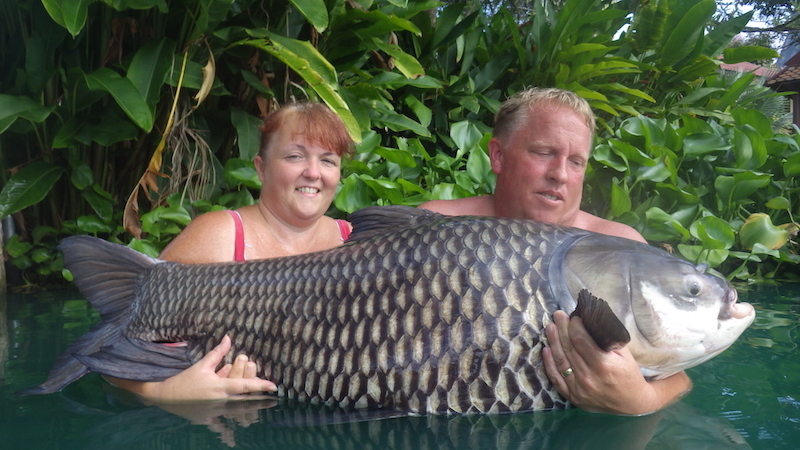 They take trips together all over the place and have been following Gillhams for a while after seeing us on TV. 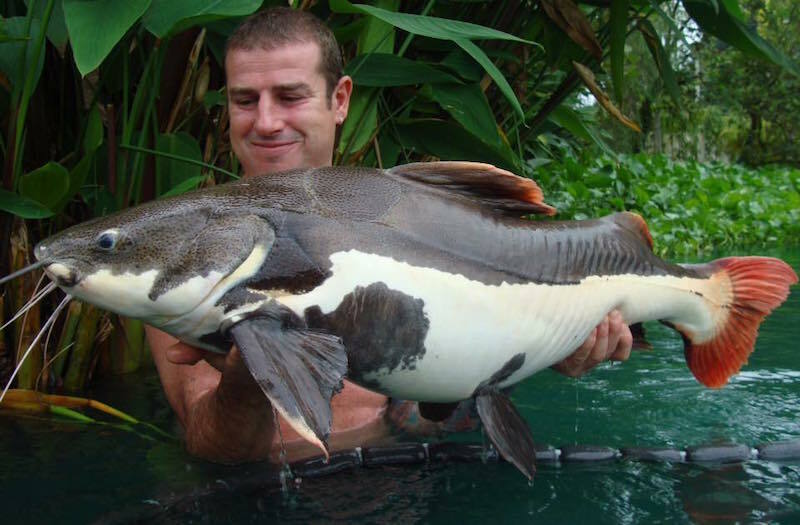 Nobody really had any target species as such and just wanted as many different species as possible. 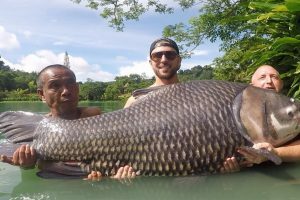 Obviously carp were high on the list, but they were just happy to catch anything. 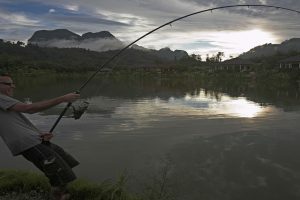 The laid back approach always works well, as they concentrate on the fishing rather than a particular species. 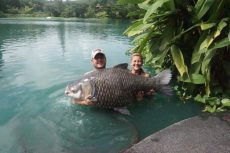 Both couples fished hard, and all went on to catch some great fish. 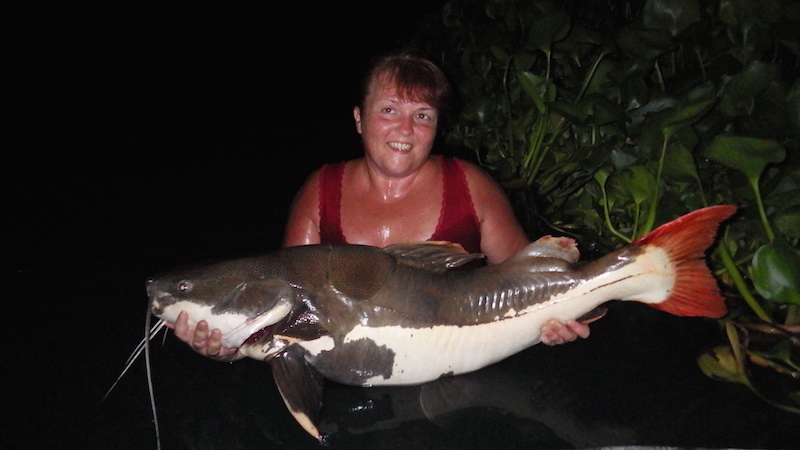 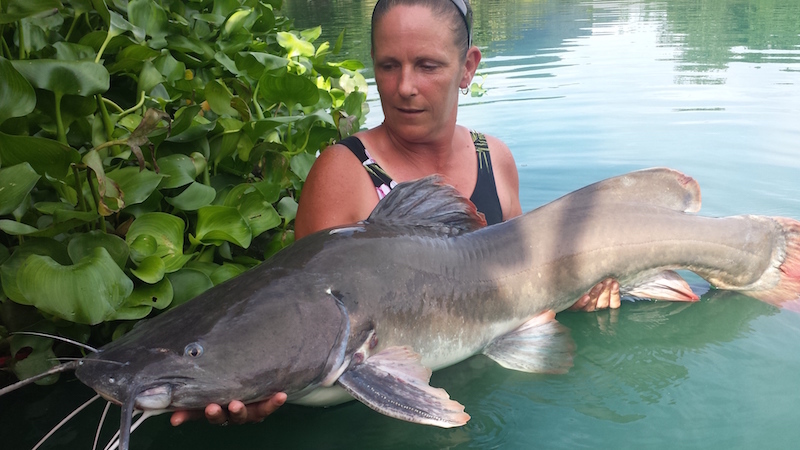 In total Paul and Dawn caught nearly 20 fish with Paul’s biggest being a Mekong catfish at 190lb, and Dawn landed her biggest carp just shy of a ton at 95lb. 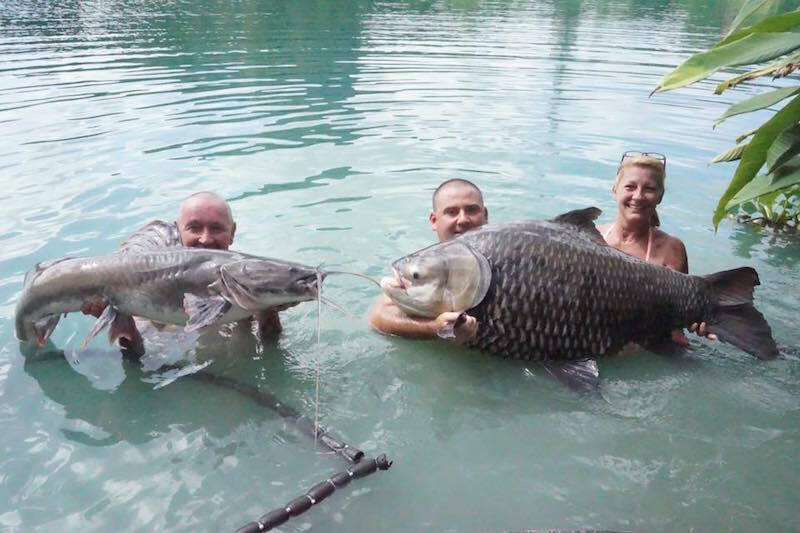 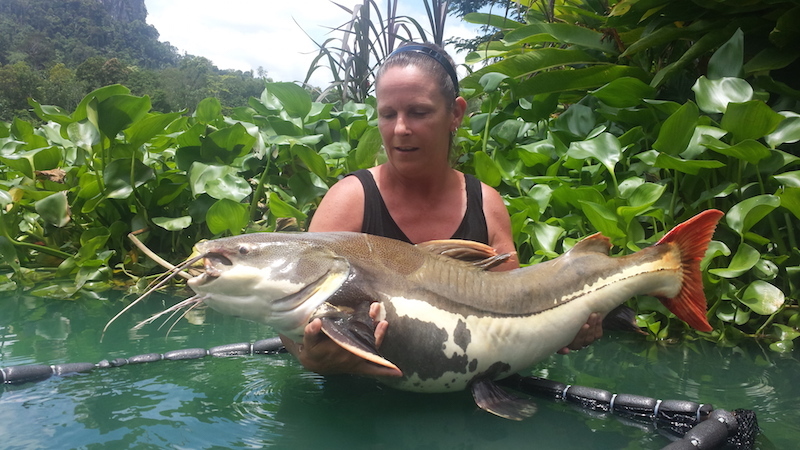 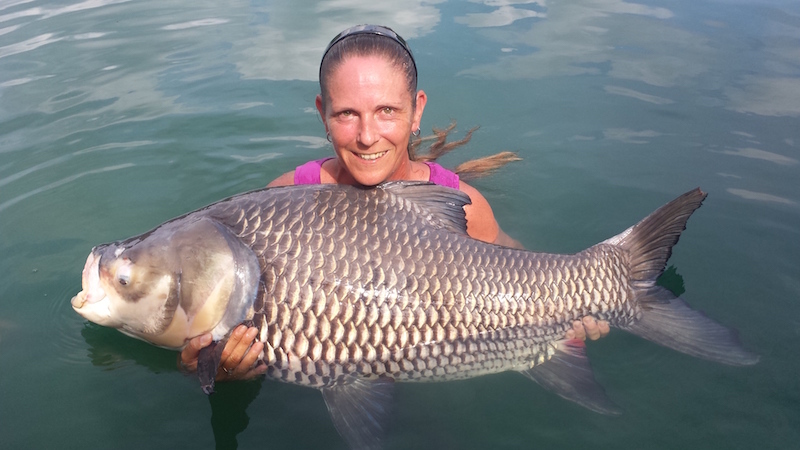 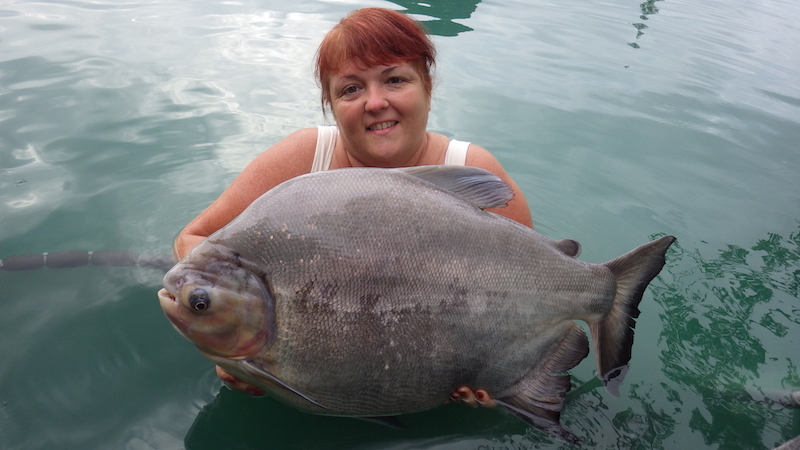 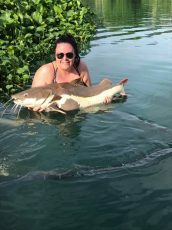 Kim and Tracy also had a great trip and caught a total of 40 fish between them including Julian’s, pacu, redtails and arapaima, and both caught Siamese carp over a ton with Tracy’s at 122lb and Kim’s at 143lb. 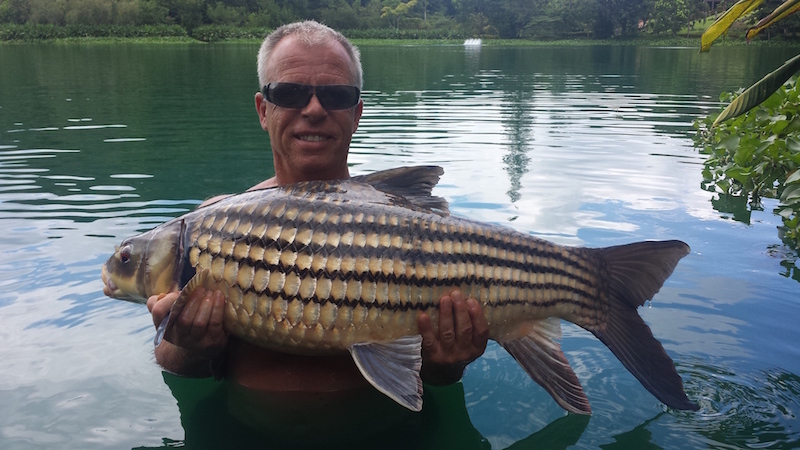 Regular UK angler Rick Merritt joined us for a week’s fishing. 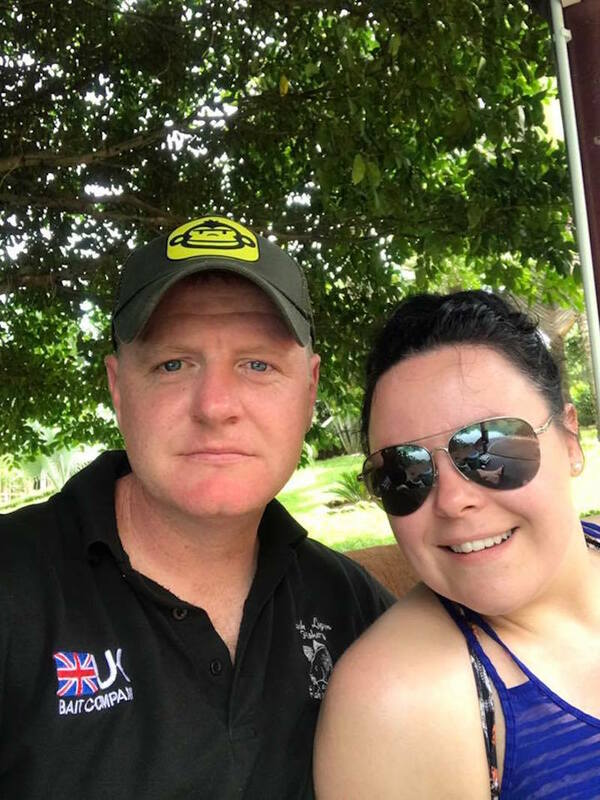 Unfortunately he was on his own this time due to his wife recently having had an operation and not being able to make the long flight. Rick is a keen and very competent angler; he’s always one of the first on the lake in the mornings and last one off in the evening. 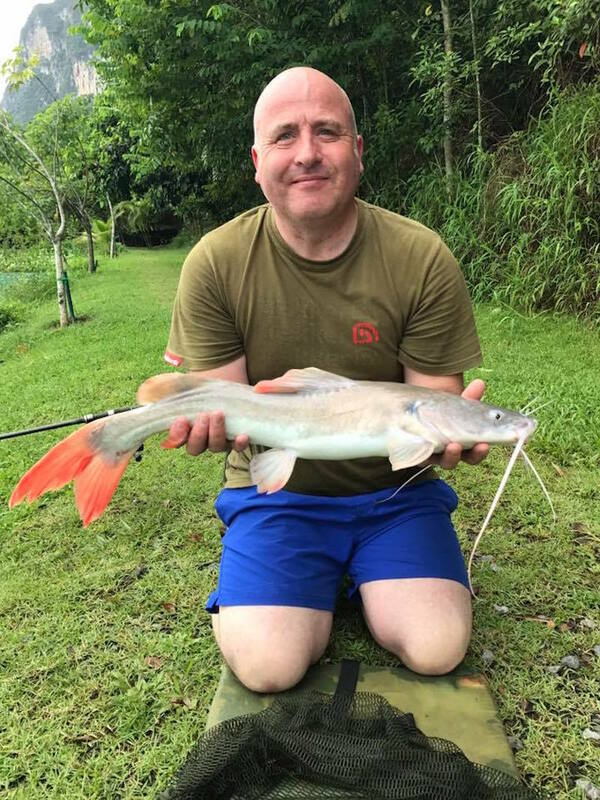 The beginning of the trip was hard for Rick, and he struggled for the first couple of days, only landing a couple of fish while others were catching, but after a couple of moves, he started catching more fish. 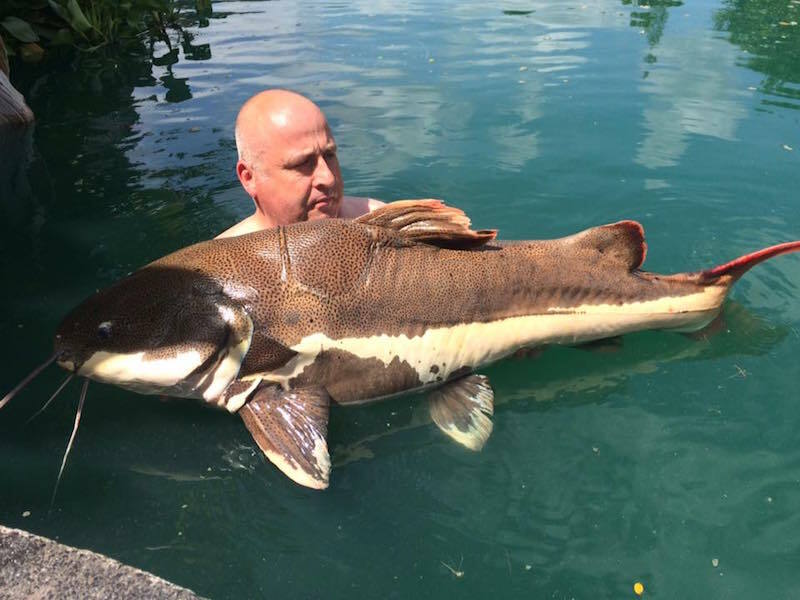 Rick likes to move around the lake and try different swims, targeting different species. Rick caught a total of 22 fish on his trip including Siamese carp, Julian’s carp and Amazon and Asian redtails, but his biggest fish of the trip was a 160lb arapaima. 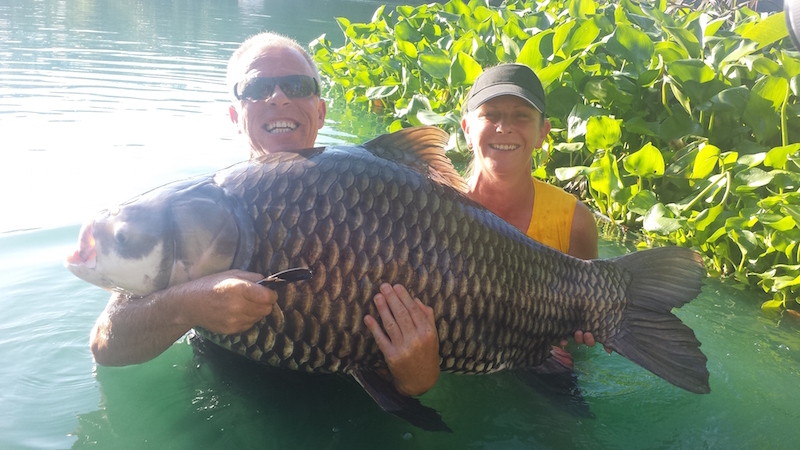 Finally we had another return angler from the UK, Wayne White, with his other half, Tracy Jane. 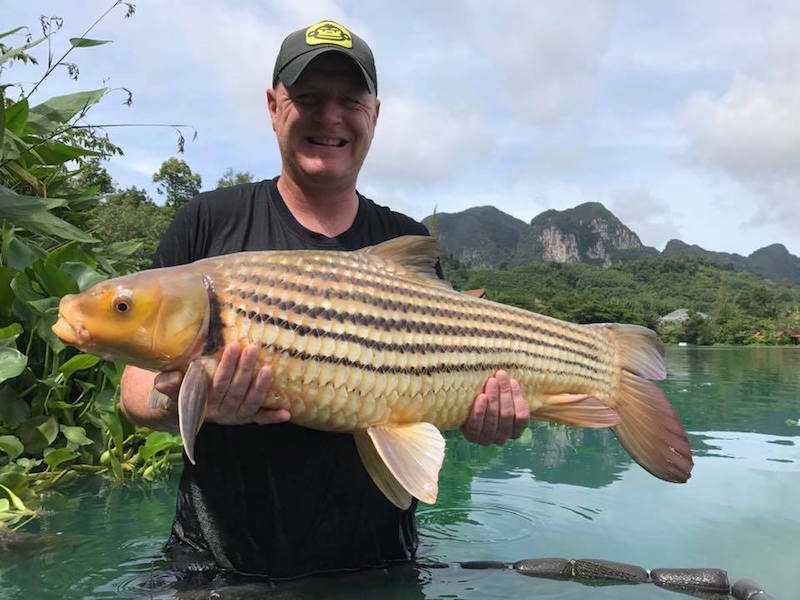 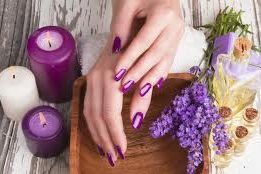 Wayne was on a two-part holiday while in Thailand, and Gillhams was his first stop before heading off to Phuket relaxing on the beaches and seeing the local sites. 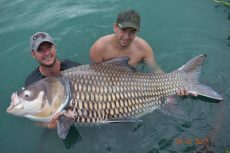 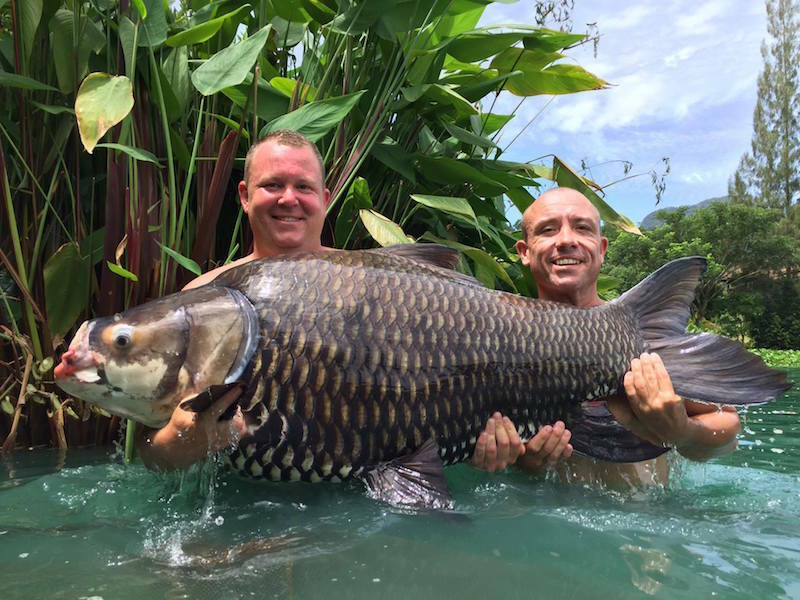 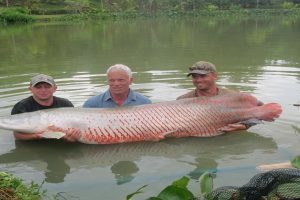 While here fishing, Wayne had some great species including Amazon redtails, arawana, Siamese carp, tambaqui and his biggest fish of the trip, an arapaima estimated at 110lb. 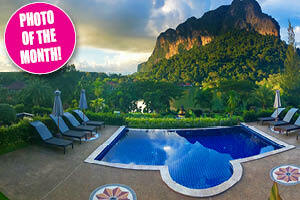 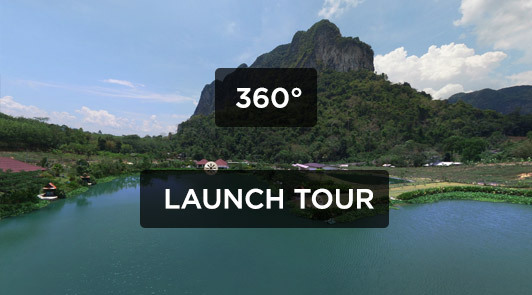 Once Wayne’s trip had come to an end, he headed off to Phuket were he proposed to Tracy. 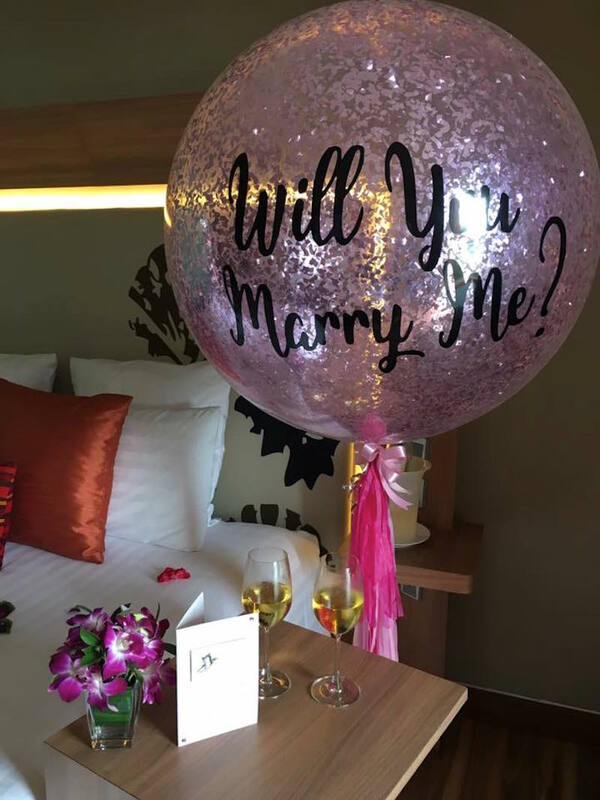 Once again we wish you guys all the best – congratulations and hope to see you on your honeymoon.